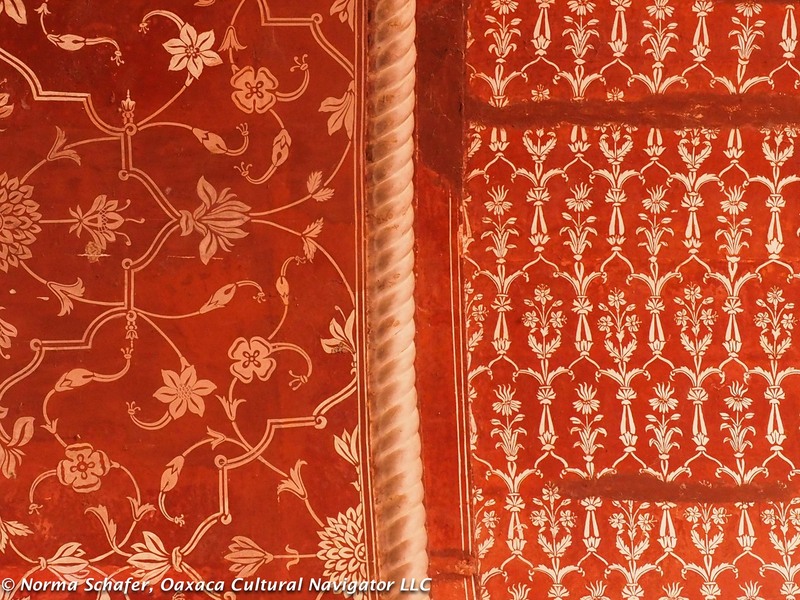 One of the best days so far is the 9 a.m. to 3 p.m. visit to the Taj Mahal in Agra, India. Yes, it’s definitely a tourist attraction and not off the beaten path. But, how can one come to India and not go there? Certainly not me! HAPPY THANKSGIVING FOR THOSE IN THE USA! Taj Mahal, Agra, India. Midday is the best light. We traveled by train and took a taxi from the station to the guesthouse. 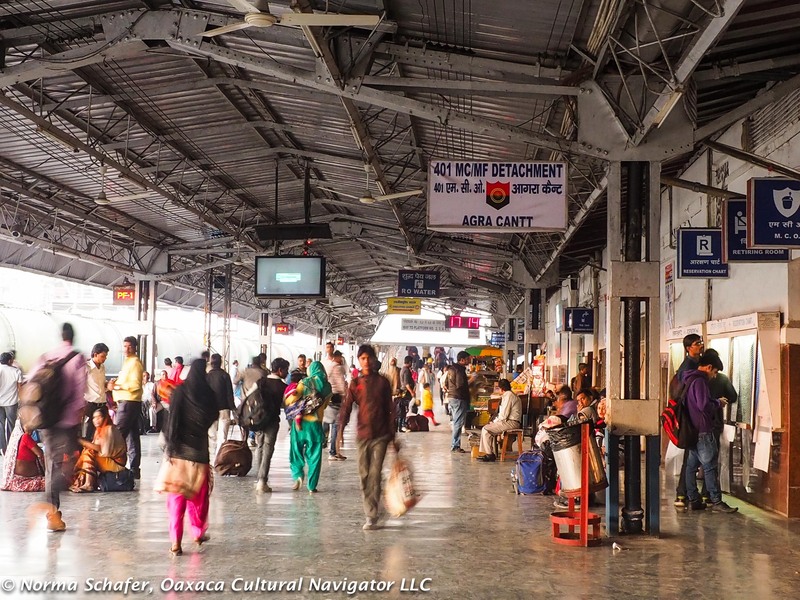 Both the Delhi and Agra stations are a mishmash of individuals and families, sitting, squatting, waiting, eating snacks. 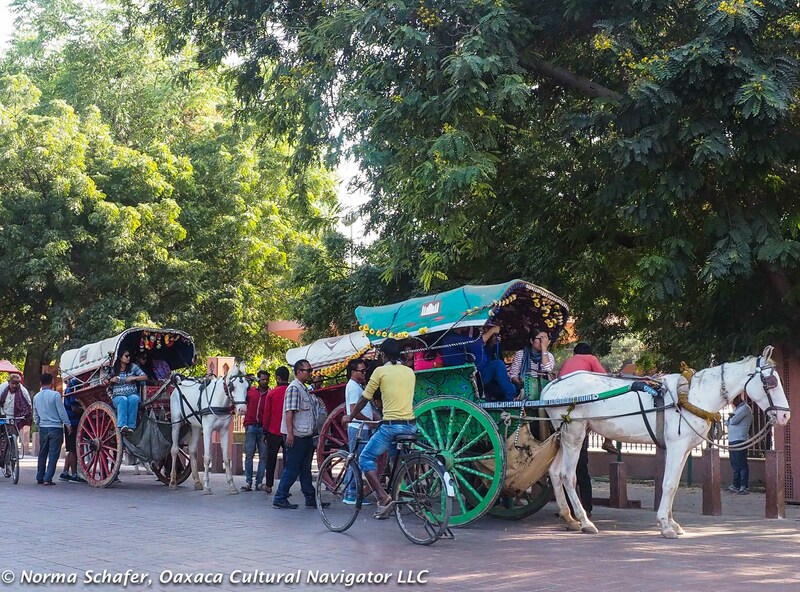 Horse drawn carts and bicycle rickshaws compete for passengers with Tata taxis. Noise and humanity is fierce. 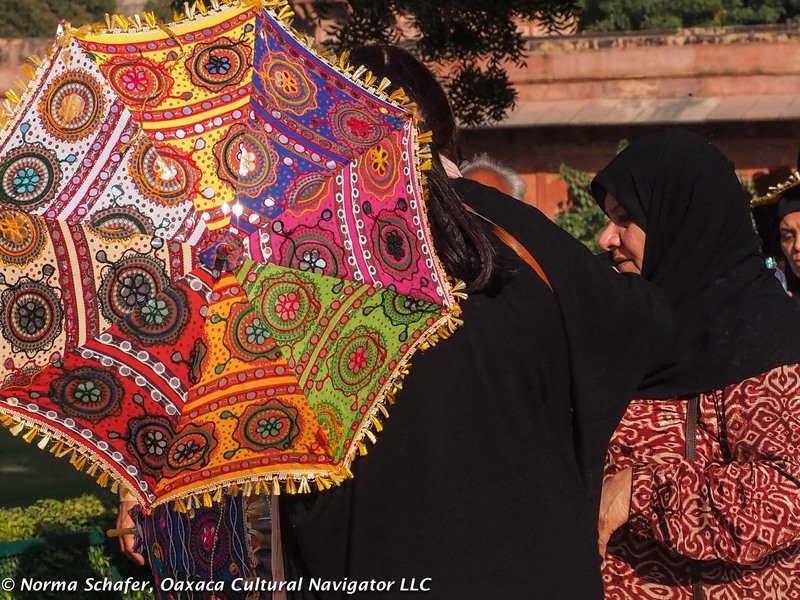 Women visiting from the far north of India, block prints, tie-dye, embroidered trim. But not so inside the grounds of the Taj, where manicured lawns and well-mannered travelers offer a visual distraction to the looming white marbled domed building. 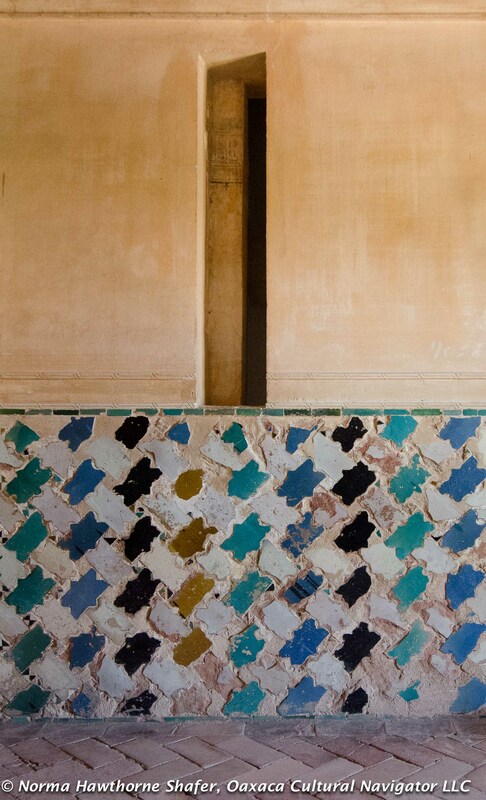 Perfect Mughal symmetry. Perfect in every way. Entry gate to the Taj Mahal, ornate with inlaid jade, coral, lapis lazuli and amber. 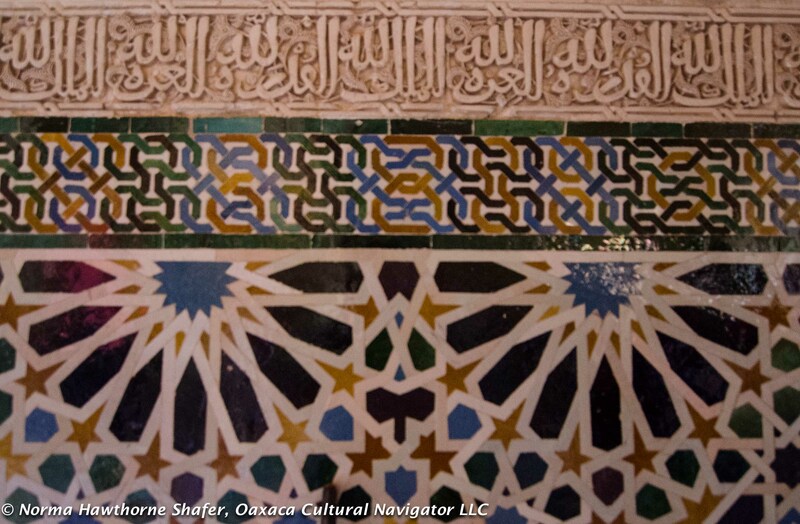 I feel the presence of many who come from around the world as if on pilgrimage. There is a mix of Moslems, Hindus, Jains, Christians, Buddhists. 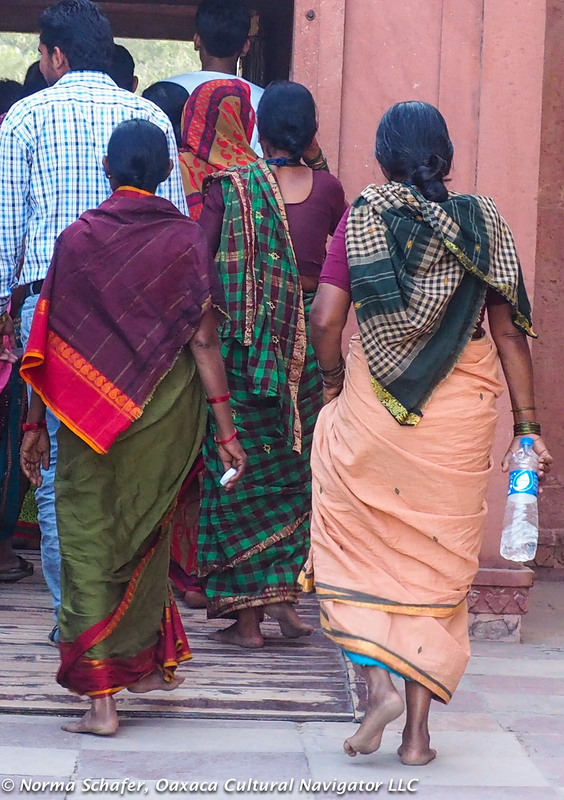 Women, young and old, wear sarees or the more contemporary pantsuit. The cloth colors are jewels. 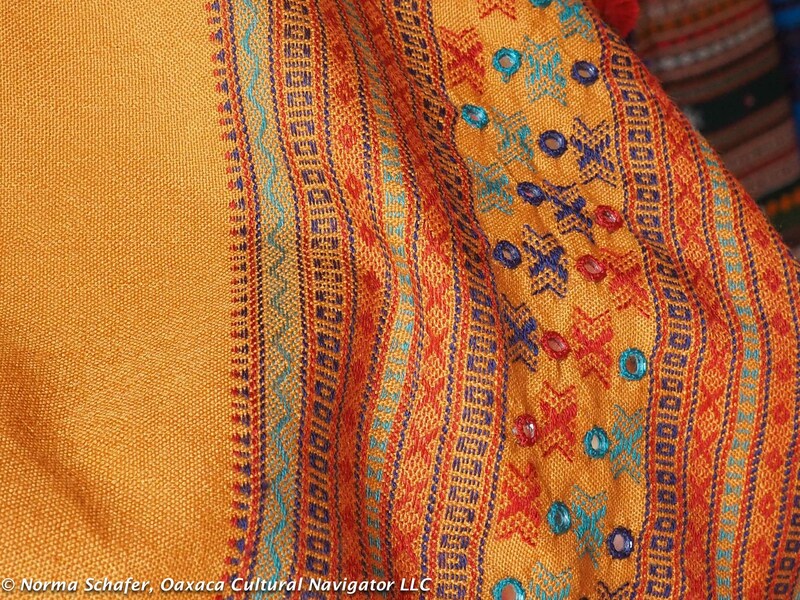 The patterns and designs signify the region of the wearer. 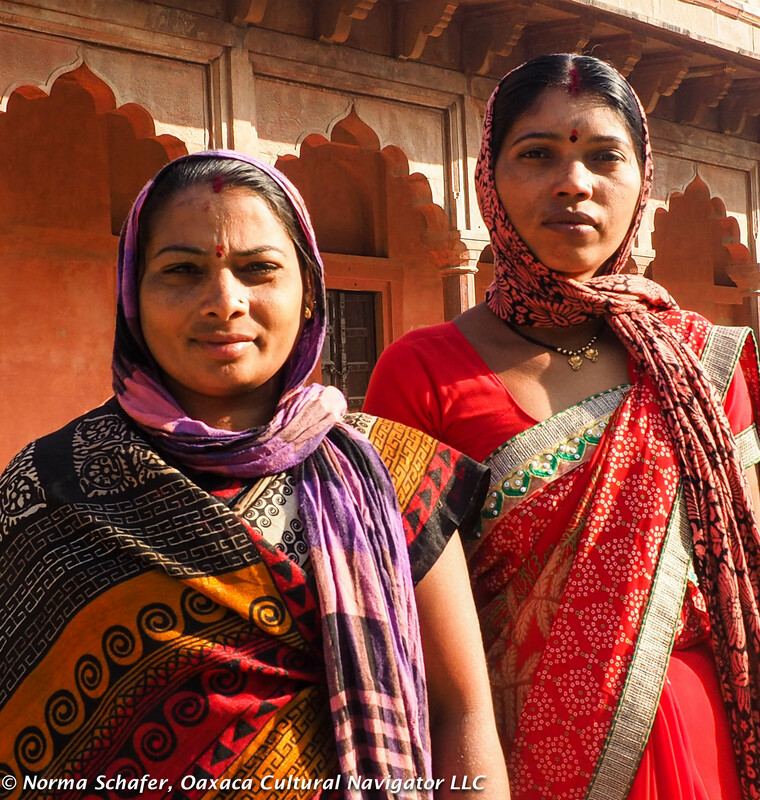 The red bindi mark on the forehead between the brows designates those who are married. 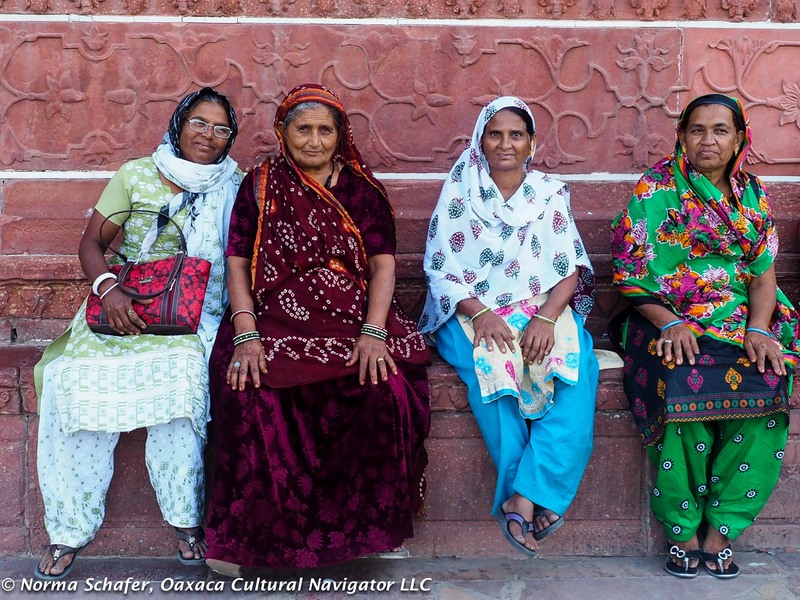 Family members from Gujarat state traveling together. 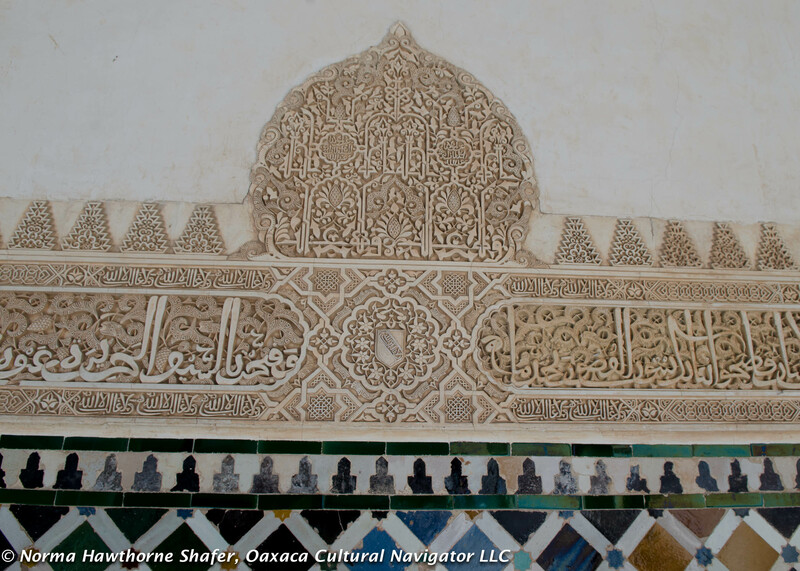 For me, this was as much about meeting people and commenting to them about their beautiful textiles as it was about being in the presence of this famous mausoleum. 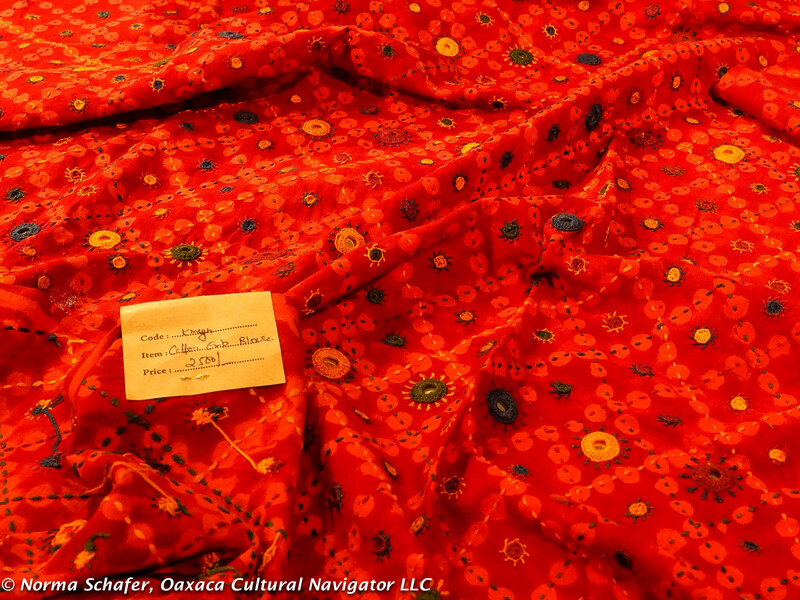 I am beginning to identify the regions where the cloth is woven, and which is made with natural dyes. Sarees in glorious colors. 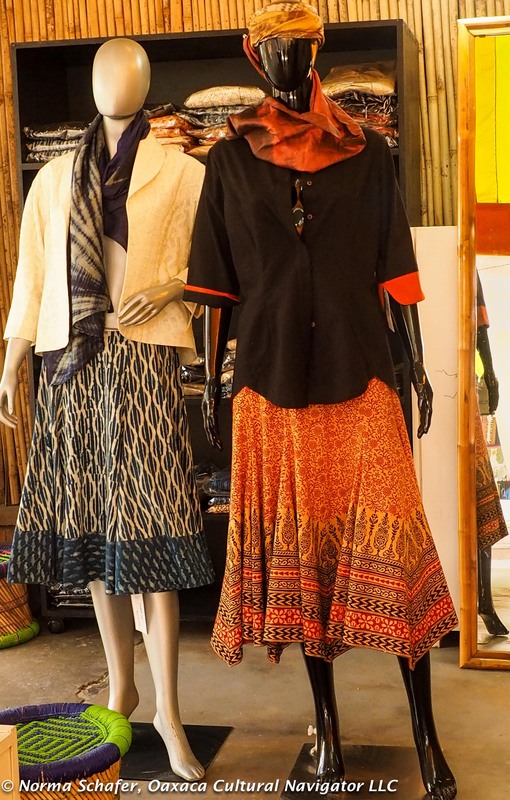 I prefer the cotton ikat and block prints. It was definitely a fashion show that kept my attention from 9 a.m. to 3 p.m. 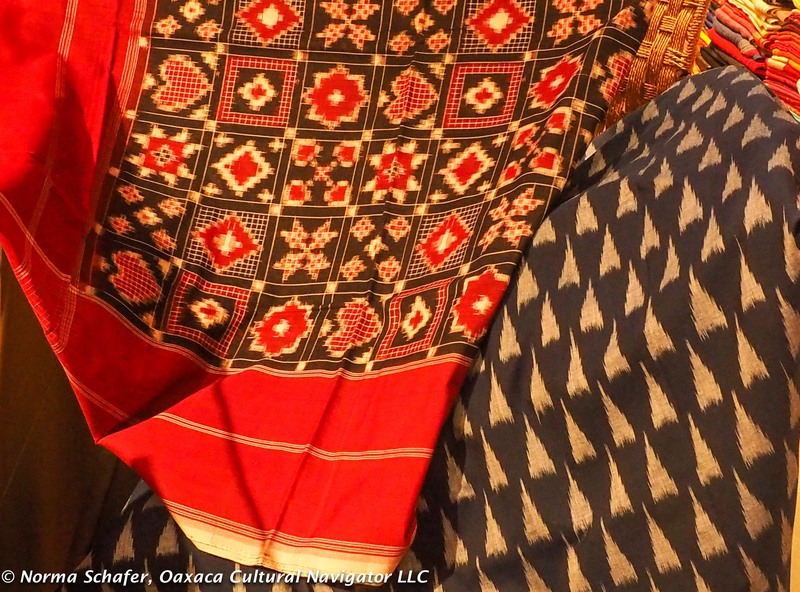 The weaving is very intricate, especially the ikat, and it is a joy to see the cloth used as daily wear. 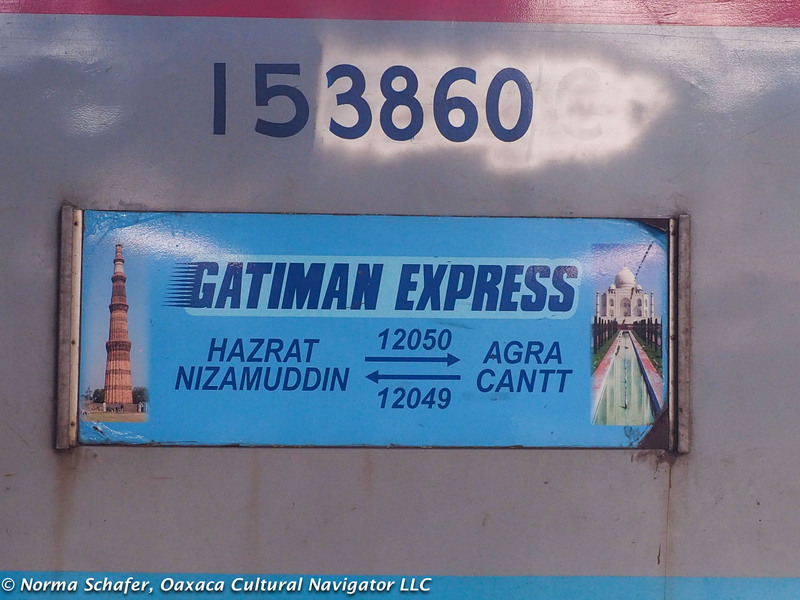 Gatiman Express, to Delhi from Agra in 1-1/2 hours. We left the guesthouse to catch the 5:50 p.m. Gatiman express (1-1/2 hours to Delhi) back to Delhi, arriving in time for a late dinner. Buy tickets in advance through a travel agent. Worker uses damp rag to clean Taj Mahal exterior. My recommendation is NOT to hire a guide but instead rent the audio cassette in English once inside. 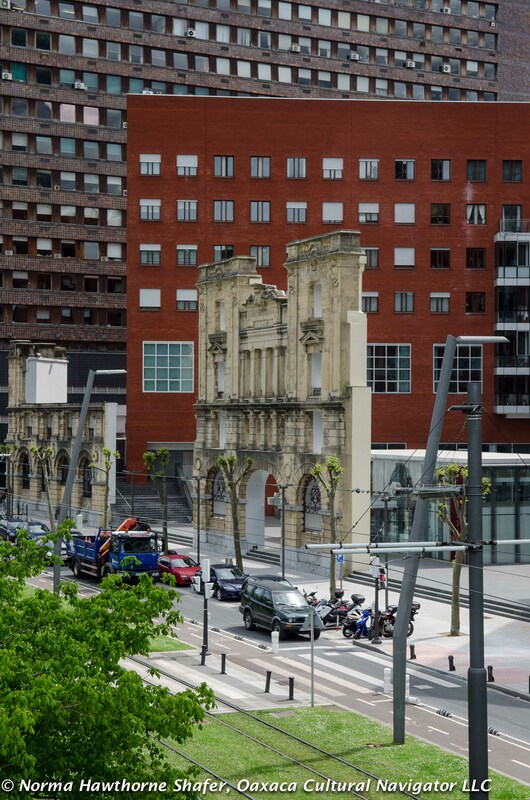 There are 16 stops that fully explain the architecture and the history. You can move at your own pace and not be harassed by an over-eager attendant who leads you at his pace. 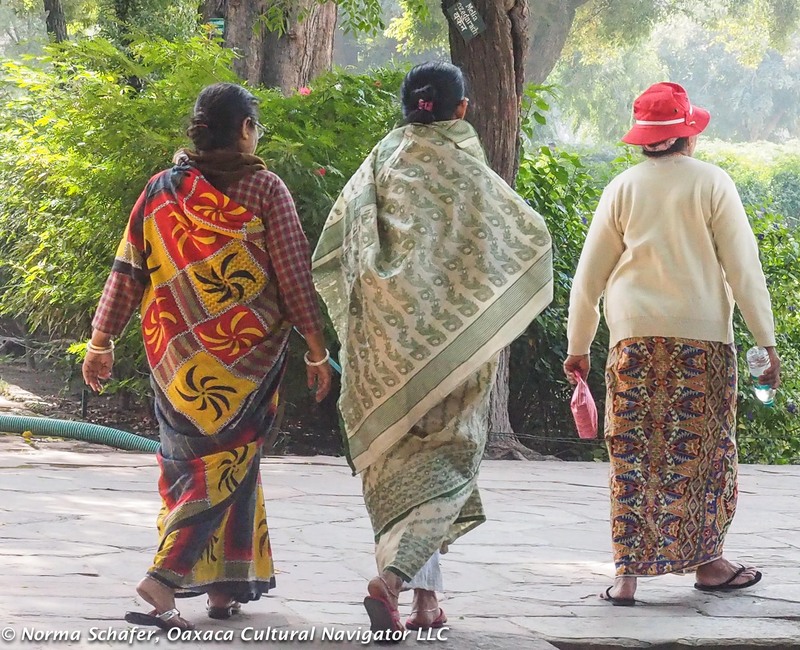 Women wearing batik block prints Malaysia walk along the garden path. 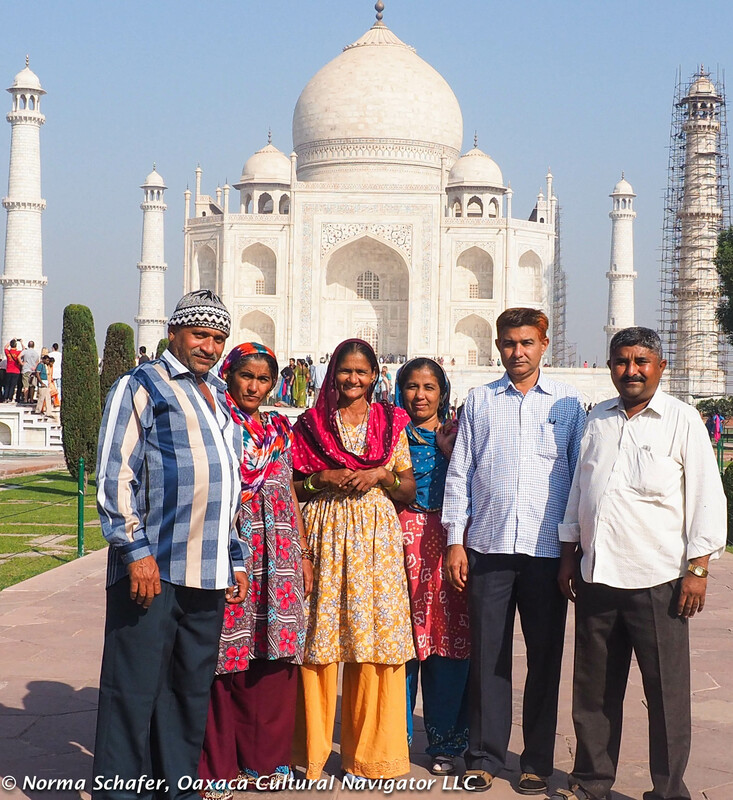 Guides tell tourists to go inside the monument at 6:30 a.m. for sunrise and at sunset to see the Taj from the gardens across the Yamouna River. 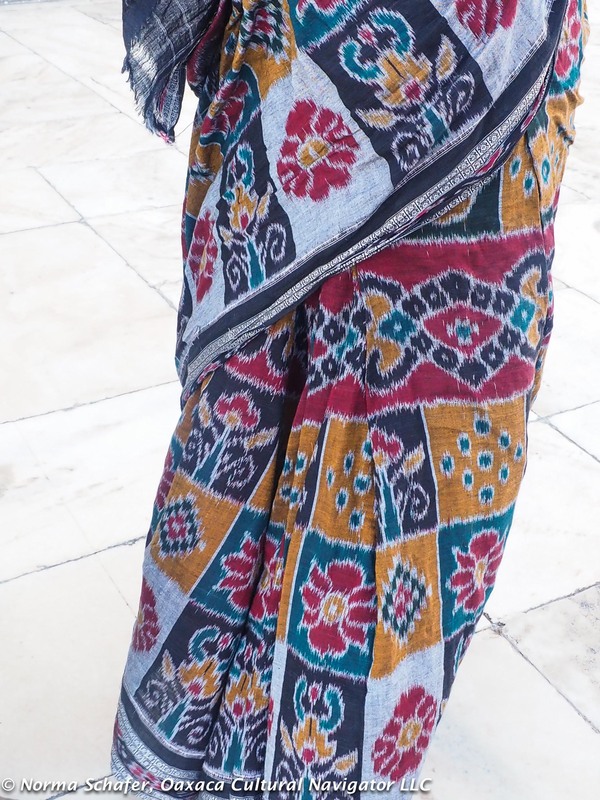 This saree is a fine quality cotton ikat with natural dyes from Orissa. 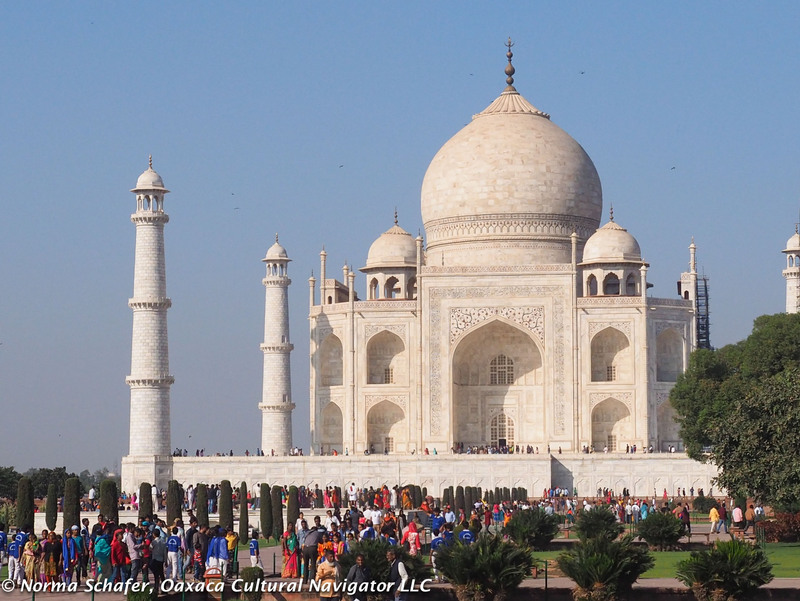 In my opinion, it’s best to see the Taj in midday, when the strong sun glows and the domes are white iridescent. My personal experience was that sunset was not dramatic. There’s pollution in Agra, although locals call it fog! Tourists from Japan. I just loved their style! Foreigners pay more for admission, 1,000 rupees. You can buy tickets online and then print them out and take them to the ticket office. From the ticket office near the East Gate, there are free electric vehicles to transport you directly to the site.Don’t fall for taxi drivers who tell you it’s too far and you need them to drive you around to get in. 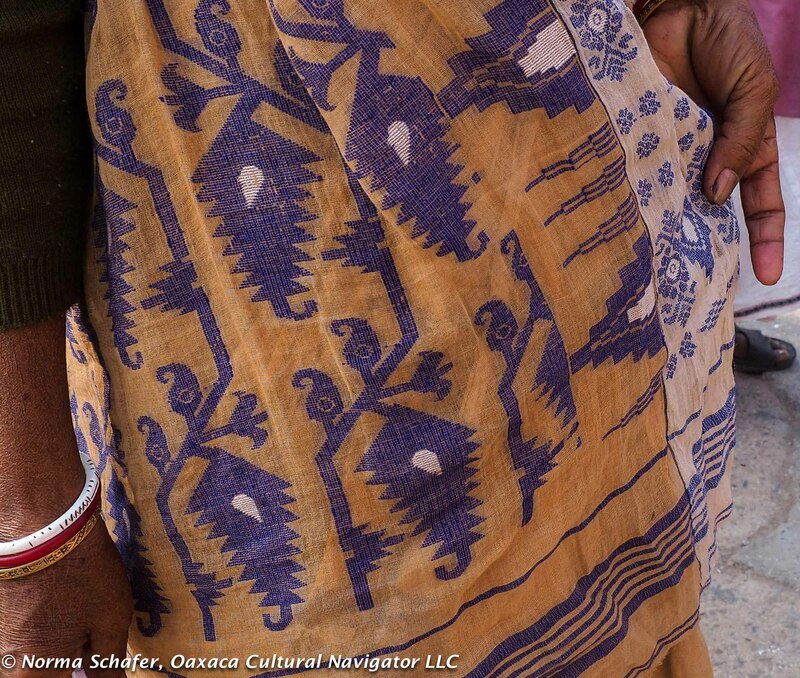 Ikat saree from Assam state in north India near the Bangladeshi border. Traveling without being in a group has its downsides. 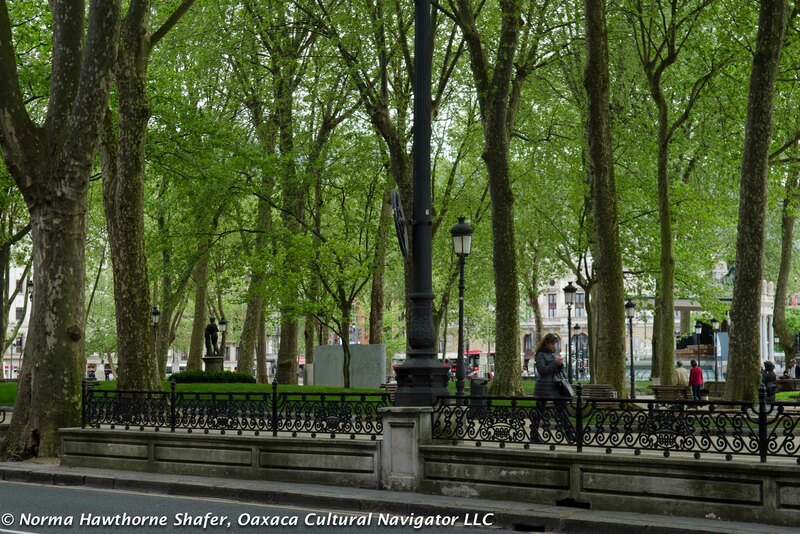 And, it’s not easy here to navigate a world where noise, pollution and traffic (hours of it) dominate the experience. Were I to do it again, I’d do it differently. 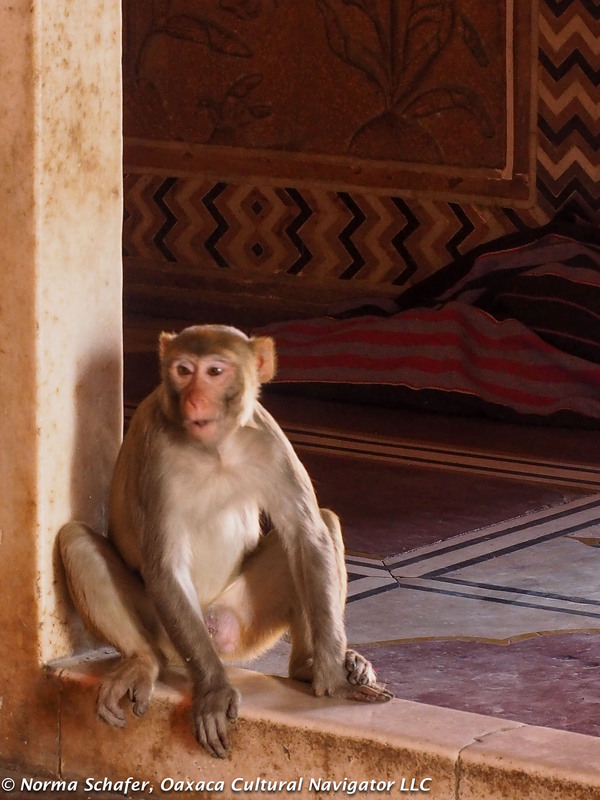 Monkeys run free throughout the Taj Mahal grounds, especially the mosque. 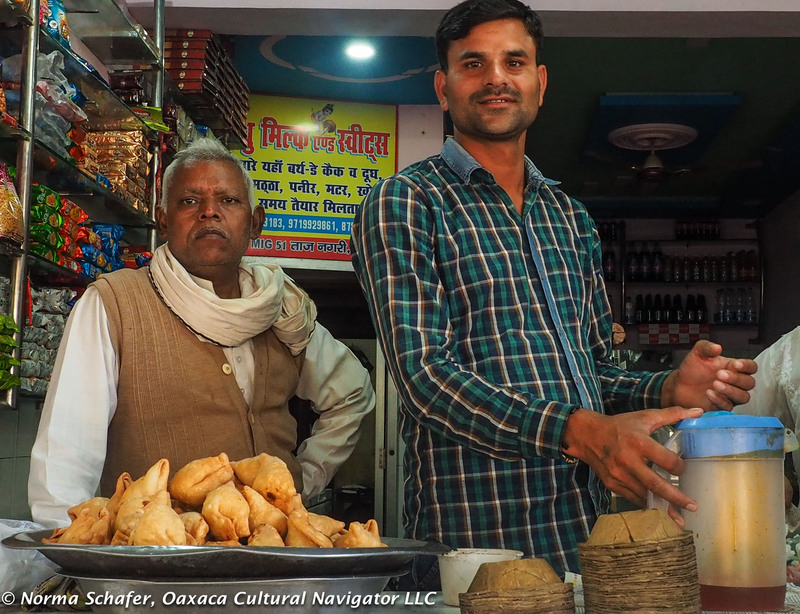 Agra is multi-cultural. About 60% of the population is Hindu, 30% is Moslem, and the remaining 10% are minorities: Christians, Jains, Buddhists, etc. Family from Gujarat, our next destination. 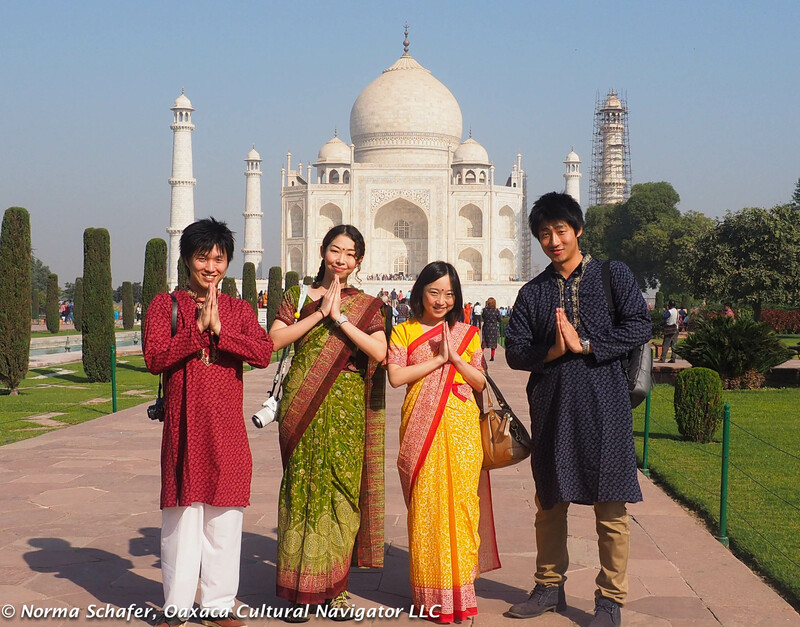 We heard so many languages and I identified people from Japan, Malaysia, the U.K., throughout India by their dress. 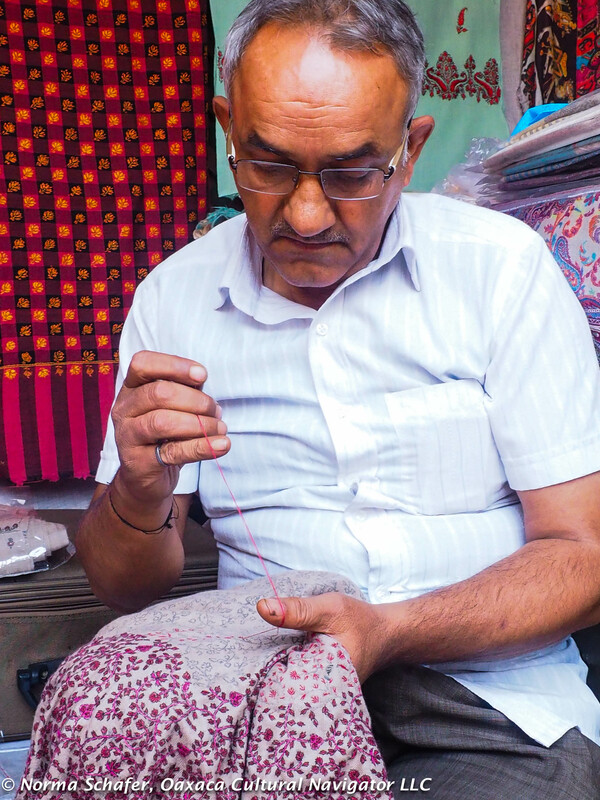 My friends here tell me that the traditional saree is making a comeback and more young women who want a cultural connection to their country are adopting the saree for everyday wear. 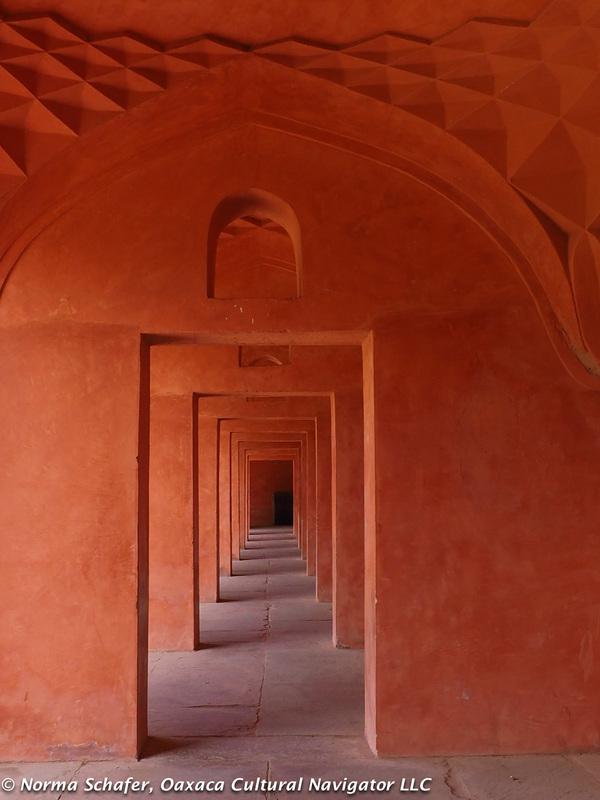 Architecture of infinite passageways. Built with local red sandstone. Old rickety carts to collect trash and grass clippings. 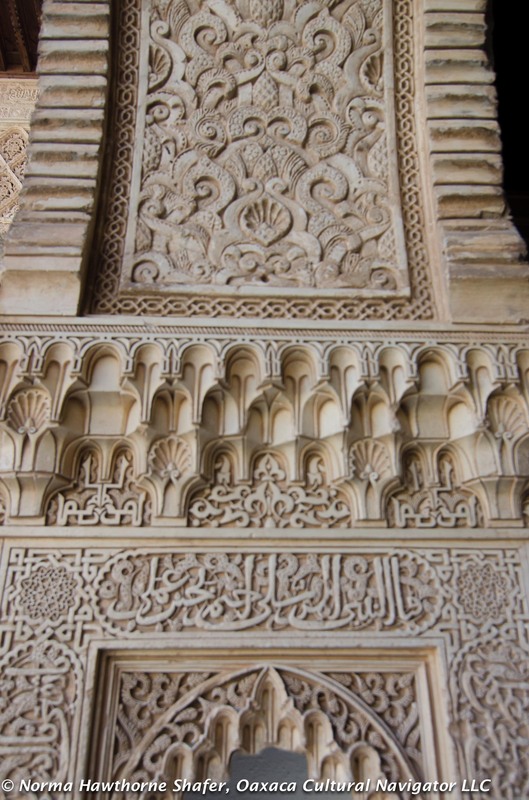 Bas relief plaster embellishment on mosque and entry gate walls. We have found the people to be friendly, warm and kind for the most part. The young, educated people especially, who helped us with bags, helped us find our way, helped us get taxis, ensured that we were going in the right direction. Agra Cantt train station. Bustling, finding our way to the right platform. Of course, the first topic of discussion from Indians is our presidential election. People are so surpised at the outcome and wonder how this could happen. I find myself in a continuous state of apology. Attendant on the Gatiman Express, fast train between Agra and Delhi. 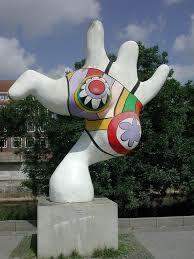 My hands clasped together, I bow slightly and say, Namaste. What else can I do? 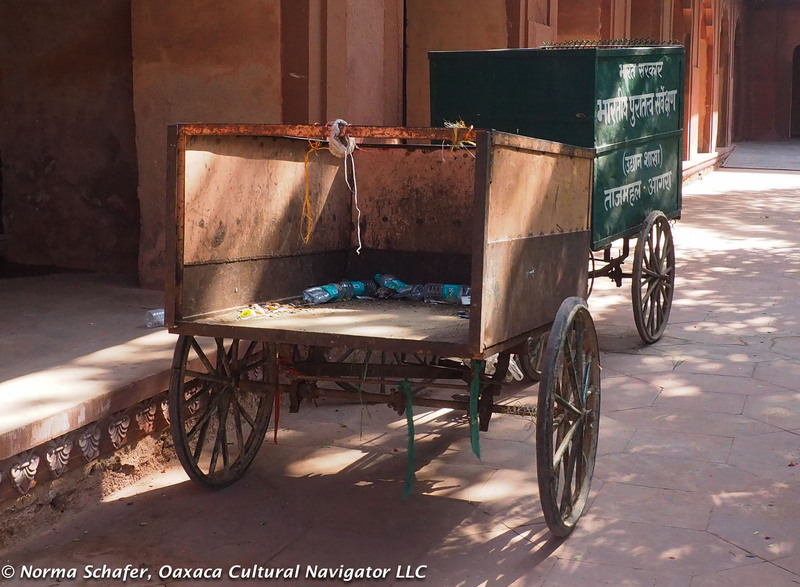 Festooned horse-drawn carriages take people around Agra town. Inside the mausoleum, people stand before the crypt of the beloved queen Mumtaz Mahal who died giving birth to her 14th child at age 38. Shah Jahan is buried with her. 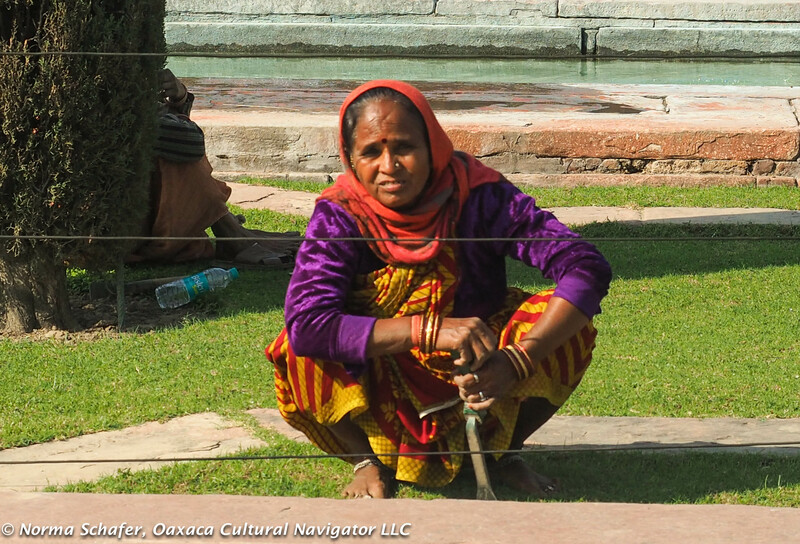 Women bend their heads as if in prayer atop the railing, throw rupees into the center. Wishes. I wonder what they wish for? Moslem women protect themselves from the sun. I don’t notice any breastfeeding women here, like I do in Mexico. I see babies cradled and sucking bottles. I do see (and have eaten) plenty of samosas, dal, chickpeas, and banana chips. Spice is king here. Samosas on main road. Safe to eat? Probably, but I didn’t tempt fate! 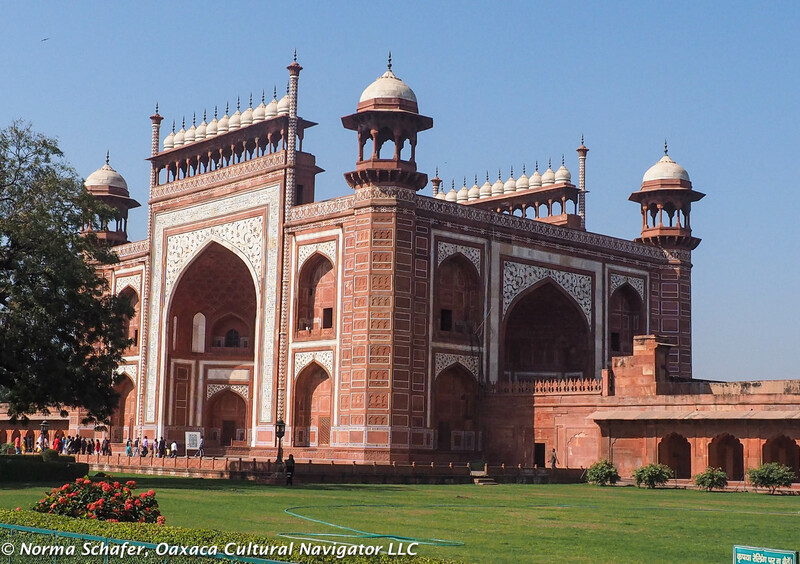 One night could be enough unless you want to explore the Agra Fort, the Baby Taj and take a day trip out to Fatepur Sikri, a stunning, simple palace complex built after the first Mughal invasion of India that was abandoned after 19 years because of water shortages. Marble floor of Taj Mahal mosque, in form of prayer rugs. Colonialism survives in India. Because I’m a foreigner and paid more for the entry ticket, I was segregated to go into a shorter queue, given a bottle of water and slippers to cover my shoes. Later, I stood in line for the ladies room. The attendant waved me to her and I followed. 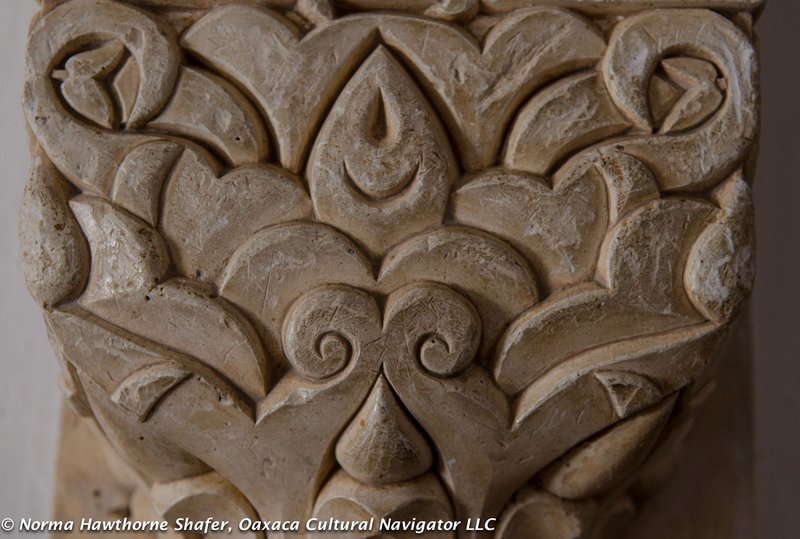 Detail of Mosque domed ceiling, Taj Mahal. She opened a door to a private bathroom stall, pristinely clean. I never got to see what the regular person uses. Maybe, it’s because of my venerable age or is it because of skin color? School girls at the Taj Mahal. Lots of school groups come here. Women here have their own safe Metro cars devoted exclusively to the and can go into the front of ticket lines before men, too. 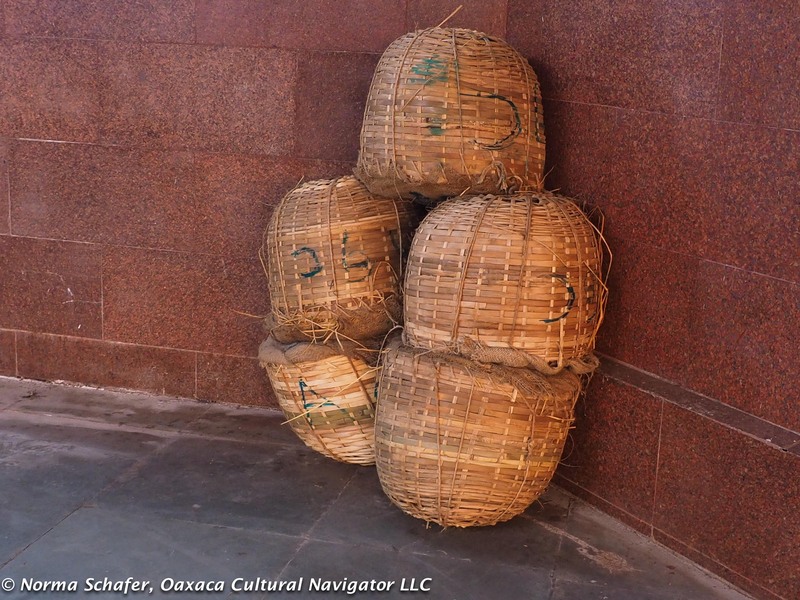 Woven baskets at the Agra train station. What’s inside? 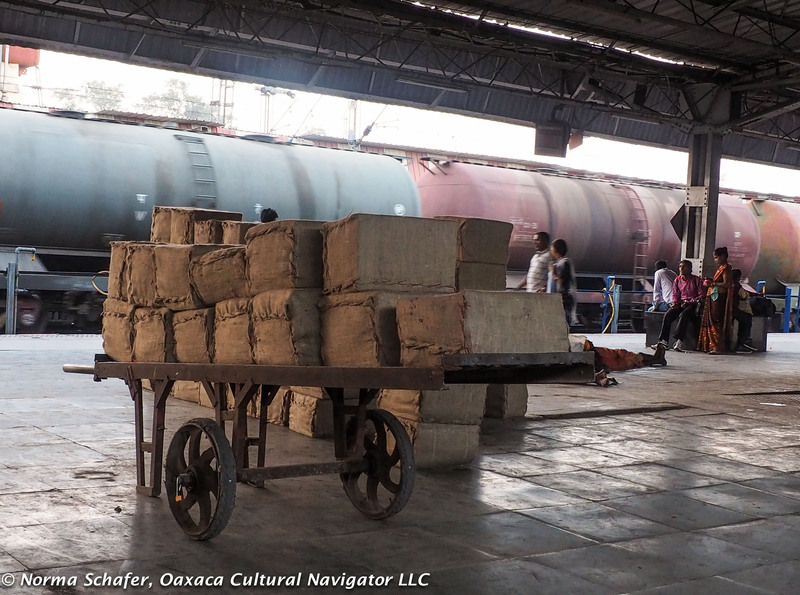 Bundles of commercial goods ready to load on the train. Tending to the Taj Mahal lawn. 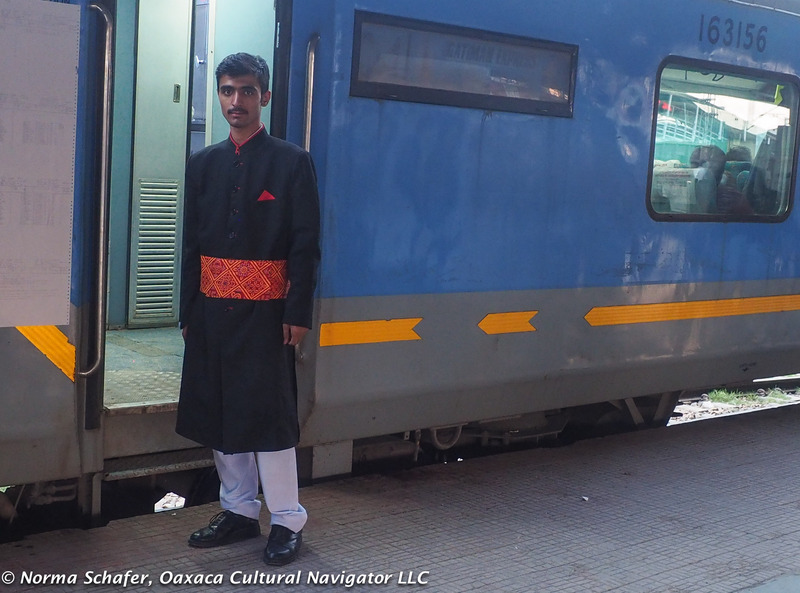 Take an early morning train from Delhi to Agra. 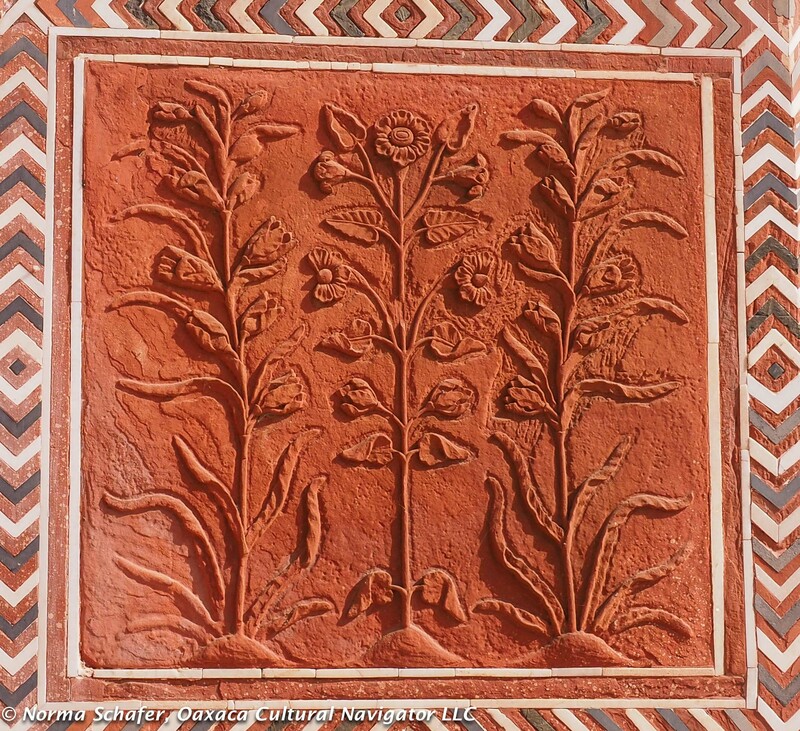 Spend Day One at Fatehpur Sikri (an hour from the city) and end it at the gardens. 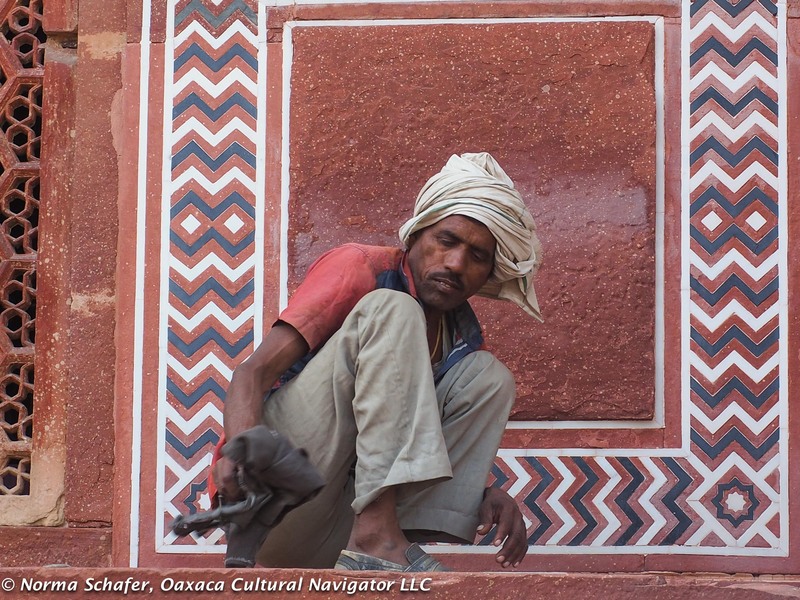 Squeeze in the Agra Fort if your have enough fortitude. Day 2, take a leisurely breakfast. Go to the East Gate to get your ticket stamped, and collect the water bottle and booties. 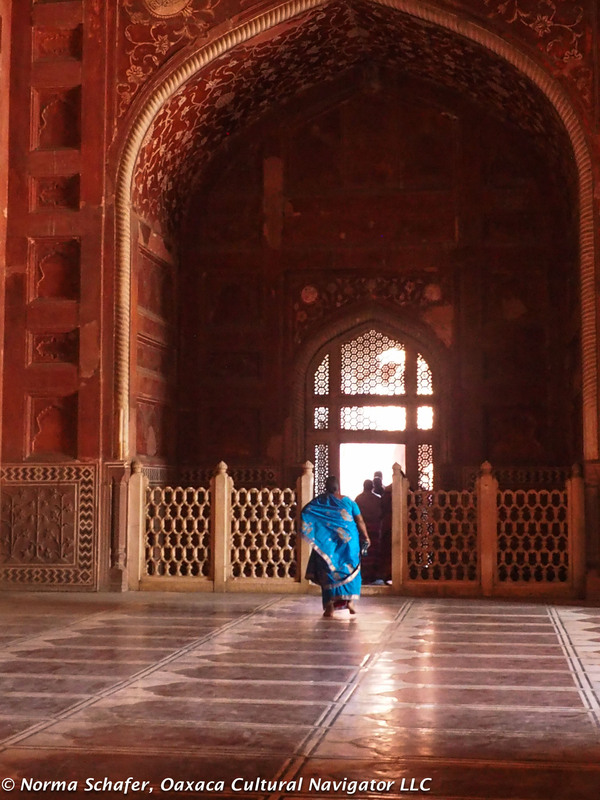 You can’t go into the mausoleum or mosque unless you wear booties or take your shoes off. Leave backpacks behind. No food or drink allowed inside except water. Be prepared to go through security. Separate lines for men and women. Rent a self-guided tour audio casette. Lunch is iffy. Not really any good place to eat but you can get packaged snacks at the Coffee Shop. You came here to see the Taj Mahal. Don’t rush through it! Where we stayed: Aman Guesthouse. Nice people. Decent room and food. Nothing special except excellent hospitality and a good price. 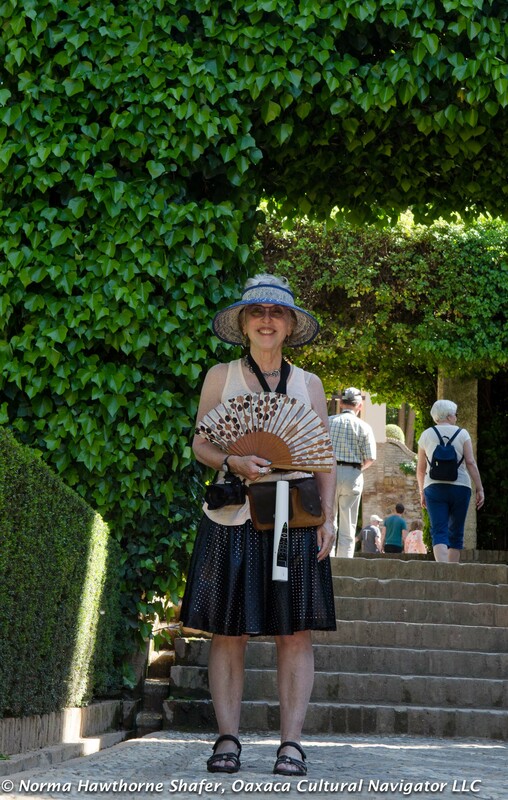 And, now I’m going backward in time: To choose and edit more Spain photographs from the recent trip. 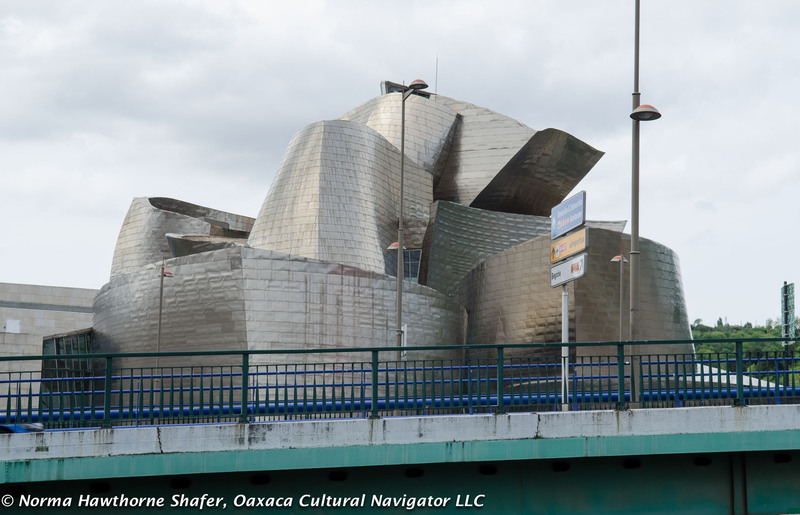 My sister and I made it a point to go to Bilbao to see the spectacular Guggenheim Museum designed by architect Frank Gehry, opened in 1997. It was well worth the three-night stay on many levels. The New York Times thinks so, too. 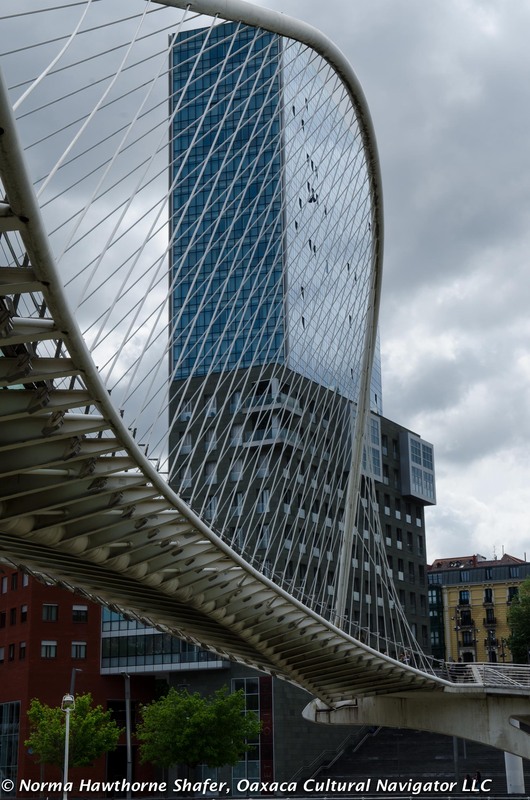 They just published 36 Hours in Bilbao, Spain. 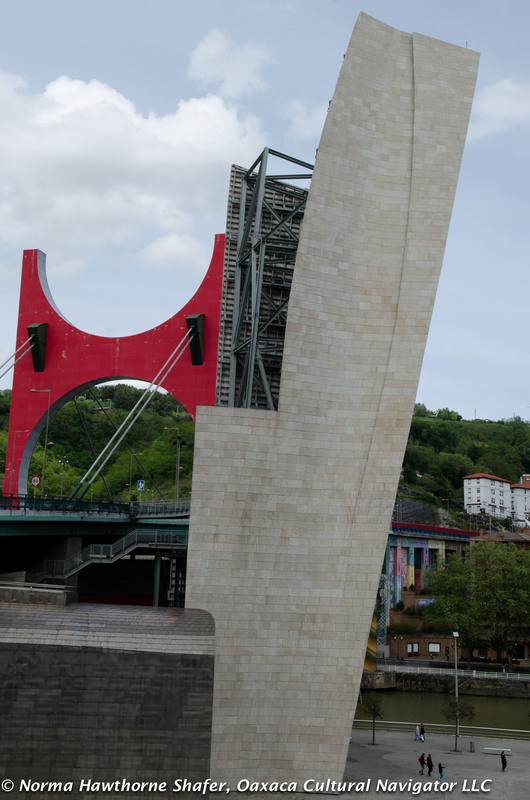 They have covered Bilbao and surrounding Basque country in several travel publications. 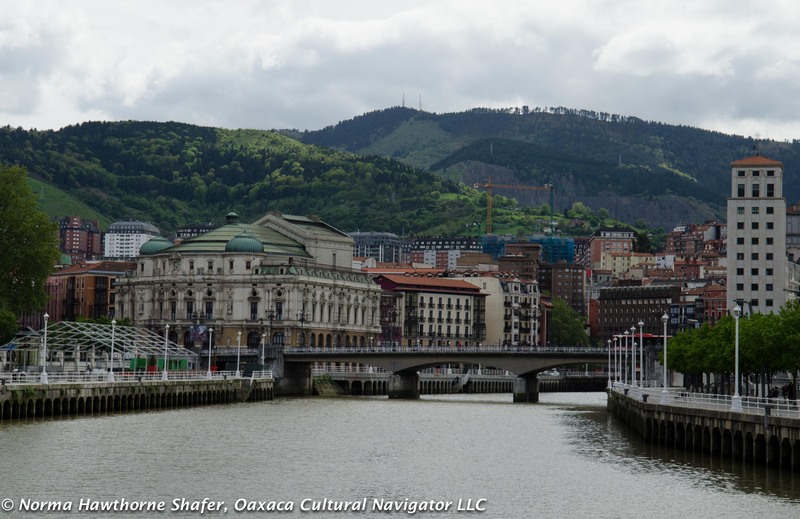 Bilbao is in the fold of a river valley ringed by mountains. 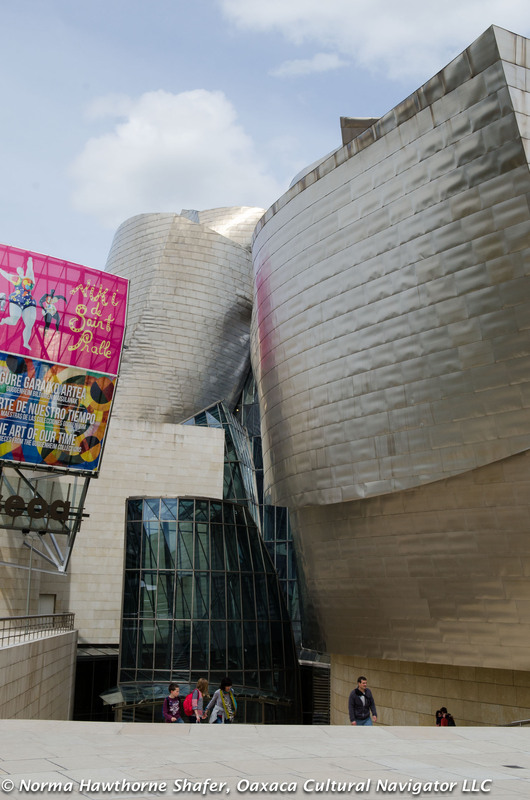 The Guggenheim Bilbao is a radical departure from its backdrop, a medieval city near the Atlantic, once a manufacturing powerhouse going through a reinvention of identity. The region is Basque. They speak Basque. Their soul is ancient, deep. Gernika (Guernica), where Franco and Hitler bombed the living daylights out of the town. Pablo Picasso captured the horror in his famously stark painting, which I saw last year in Madrid. 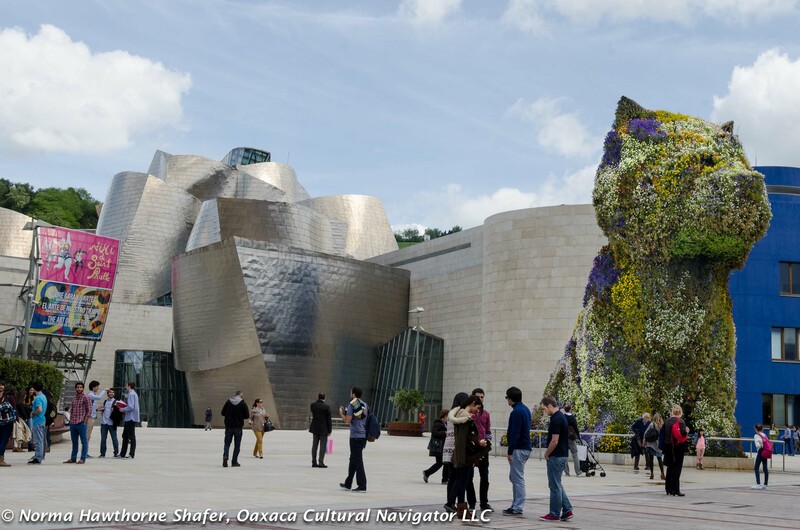 The town is only 25 kilometers north of the Basque capital of Bilbao. 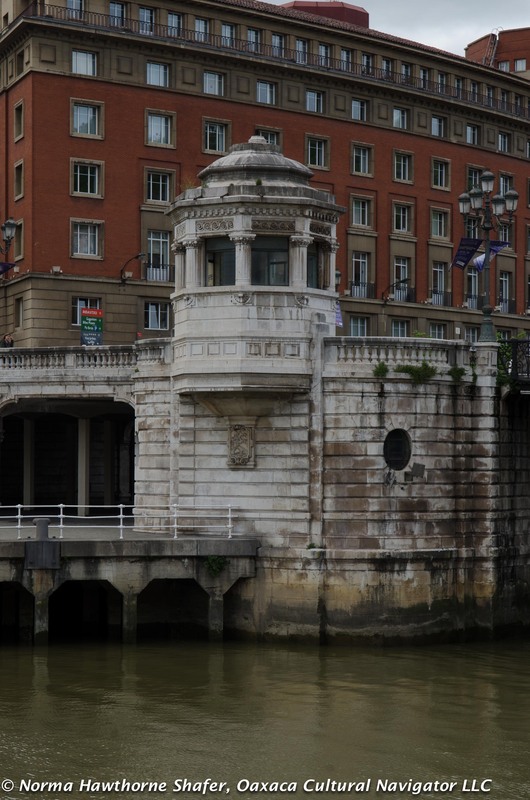 In Bilbao, stay in the medieval old quarter along the picturesque Nervion River. You might choose, as we did, the wonderful, clean, comfortable airbnb apartment owned by charming Luisma aka Bidebarietasiete Bilbao. He provided coffee, French press, a bottle of wine and fantastic hospitality. 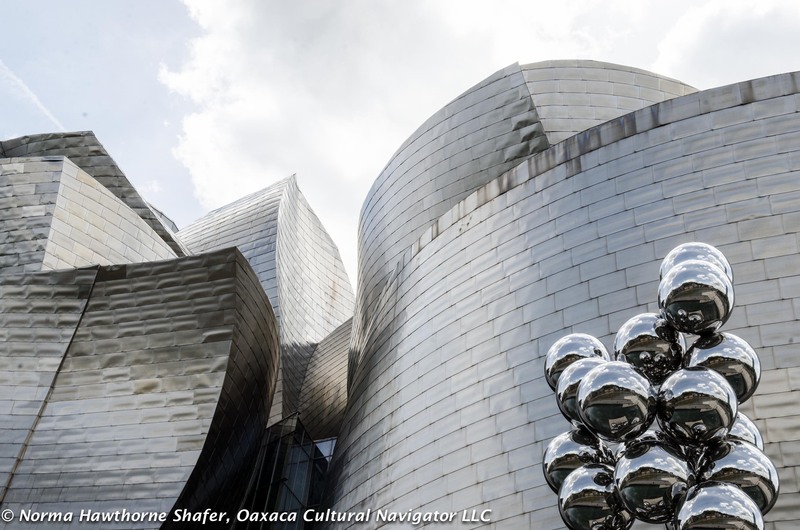 This was a block away from the picturesque river, walking distance to the Guggenheim (or take a nearby tram) and just steps from incredible gourmet cheese and wine shops, and great tapas bars. Try the yogurt with sweetened carrot puree. I loved it. Our intention was to do a day trip up the north coast of the Bay of Biscay along the Atlantic to the coastal town of San Sebastian. But, there wasn’t enough time. So, we are saving this for another trip. 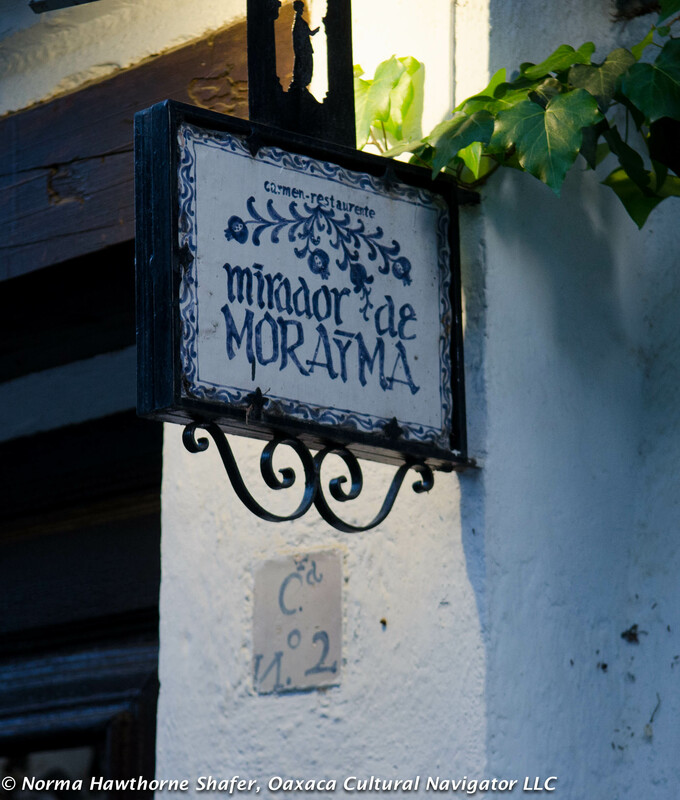 Throughout the region are Michelin star restaurants worthy of attention, small villages tucked into mountain valleys unchanged by centuries, narrow, cobbled walking streets flanked by tall, colorful stucco buildings adorned with wrought iron curlicue balconies trimmed in flower baskets. 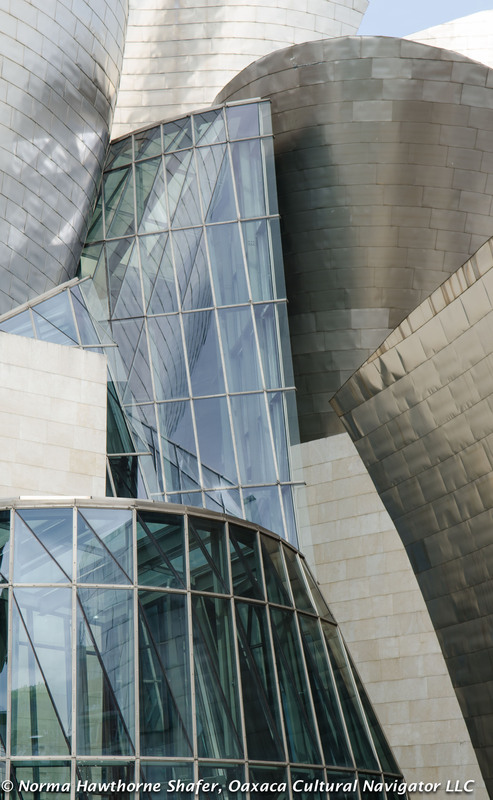 At the Guggenheim we were mesmerized by the architecture, which many consider to be THE attraction. We were permitted to take as many photographs as we wanted of the building. No photos of the art installations were allowed. 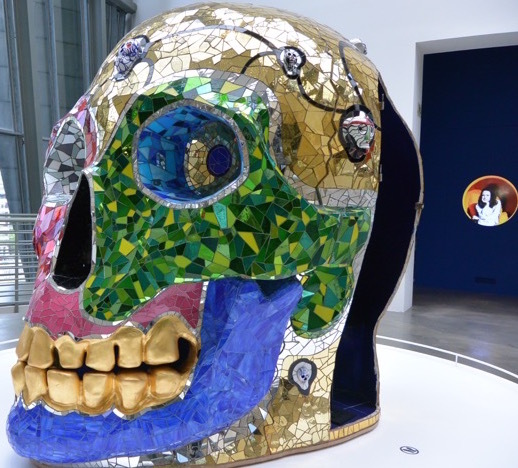 The special treat was a temporary exhibit of Nikki de Saint Phalle‘s Nanas and other works, there until June 7, 2015. What do these images of women represent? Find out by clicking on her name. It’s not just about being black, white, fat or thin. It’s about how we think of self and our role in the world. 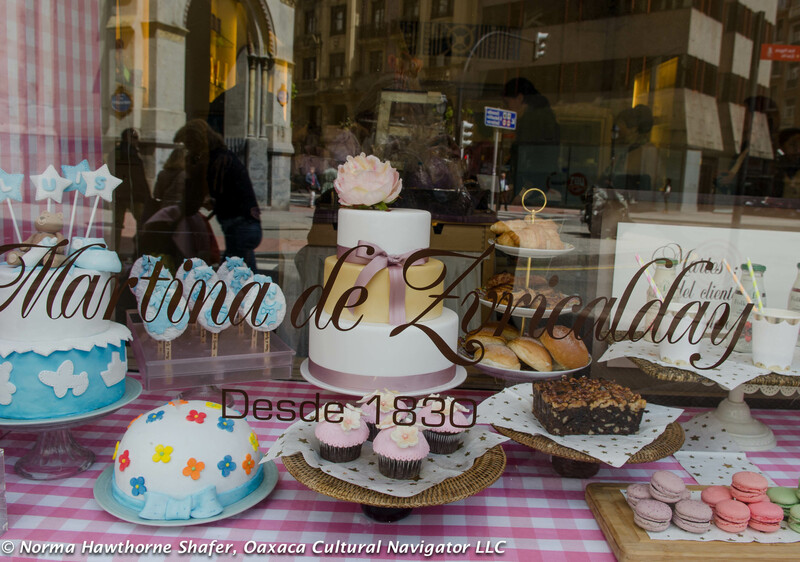 Out on the street (I walked 16,000 steps this day), you come across pastry shops like this one with lines out the door. I wanted to … indeed … indulge, but the line was too long. 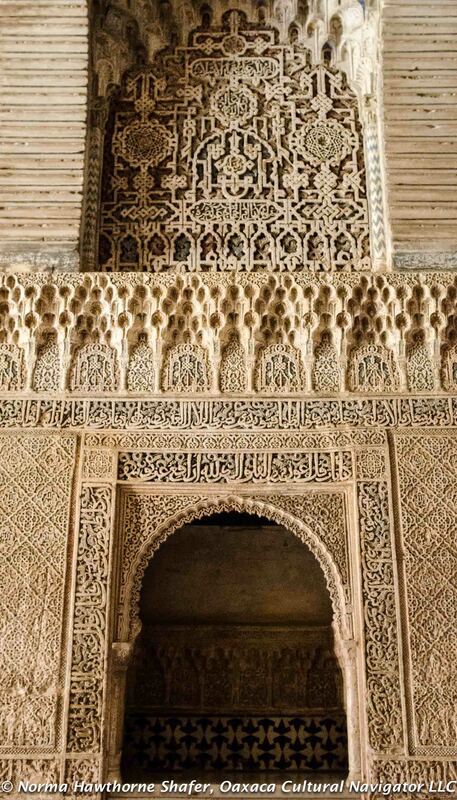 Carved wood, intricate plaster arches and decorative columns, outstanding 13th century mosaics, and water, water everywhere define the palaces of the Nasrid kings at the Alhambra, Granada, Spain. 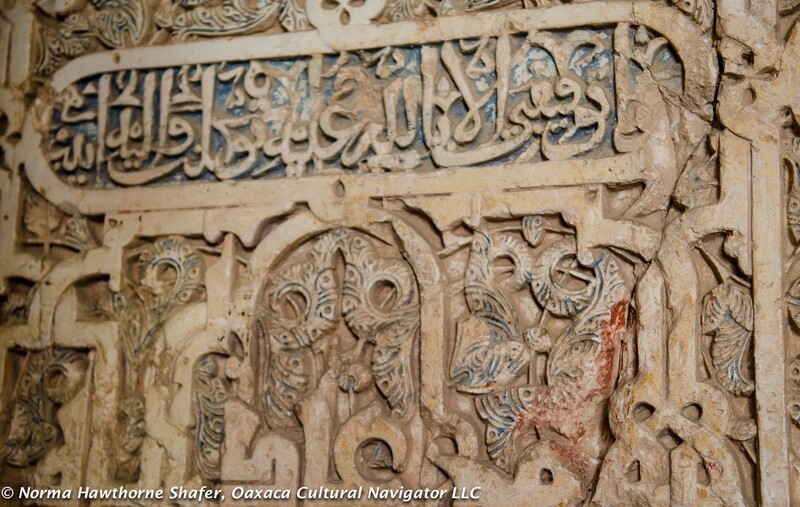 The best description I have found is this one from Islamic Arts that offers you a virtual walking tour. It is not easy to gain entry. One must buy tickets online a month in advance of your visit. They are not available any earlier. My sister did this by staying up all night the day the tickets went on sale for the dates we wanted. There is a nine hour time difference between Spain and San Francisco. Tour groups seem to get priority, so within the hour of opening sales, the only tickets remaining were those in the afternoon time slot. That turned out to be a good thing for us since we still hadn’t adjusted to the time difference, we were moving slowly and we were inside the shade of the gardens and palace during the hottest part of the day! Buy tickets for two days. One day is not enough. 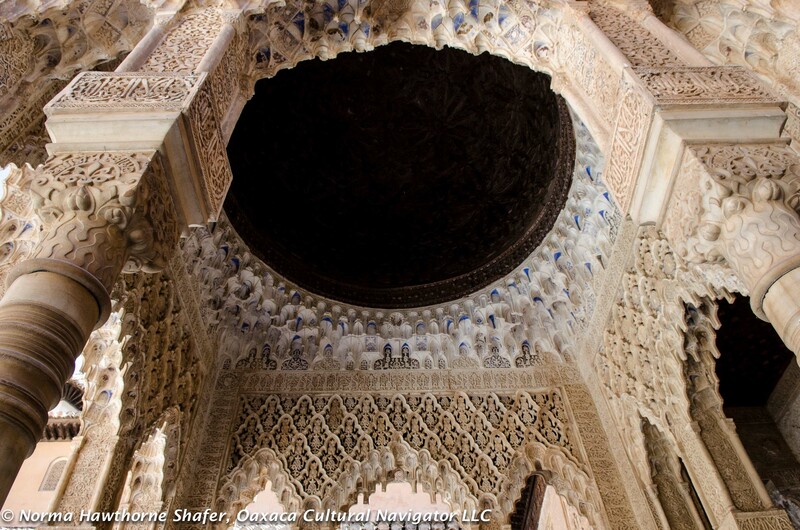 It takes one day to cover the Alhambra. 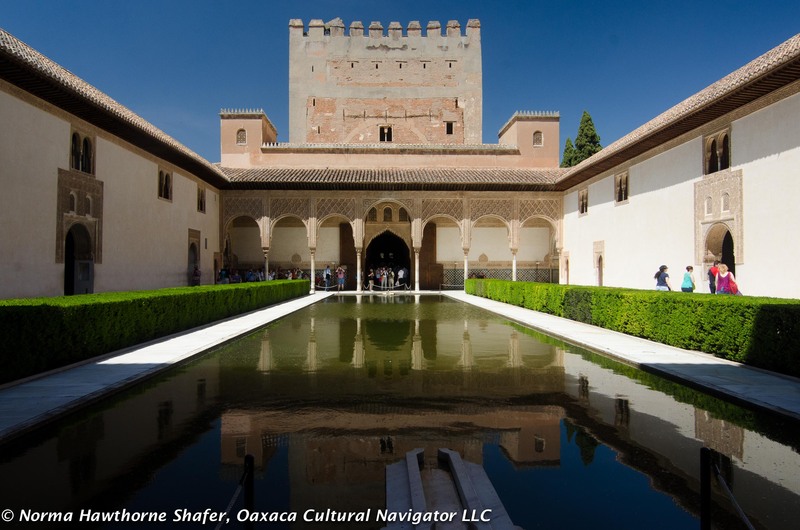 There are two palaces — The Nasrid Palace and The Generalife, known as the summer palace. The territory is vast. There is a lot of walking and stair climbing. Rent the audio guide. It’s a must and definitely worth the extra euros. 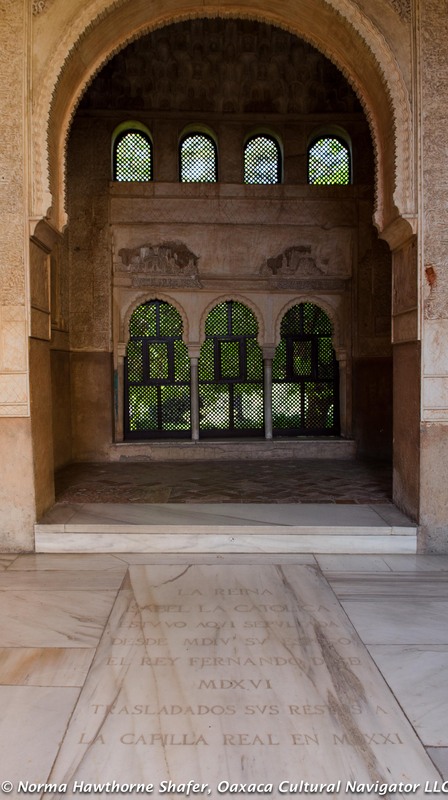 There are two stations: one at the entry by the ticket office and another inside by the Charles (Carlos) V Palace. You must return the guide to whichever place you picked it up because you have to leave an ID card as security. 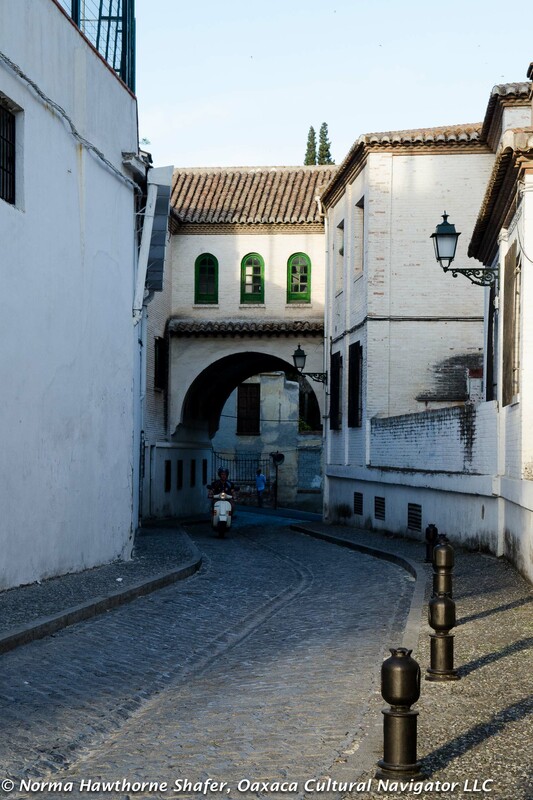 Eat lunch or dinner on the patio of the beautiful Parador Granada hotel. 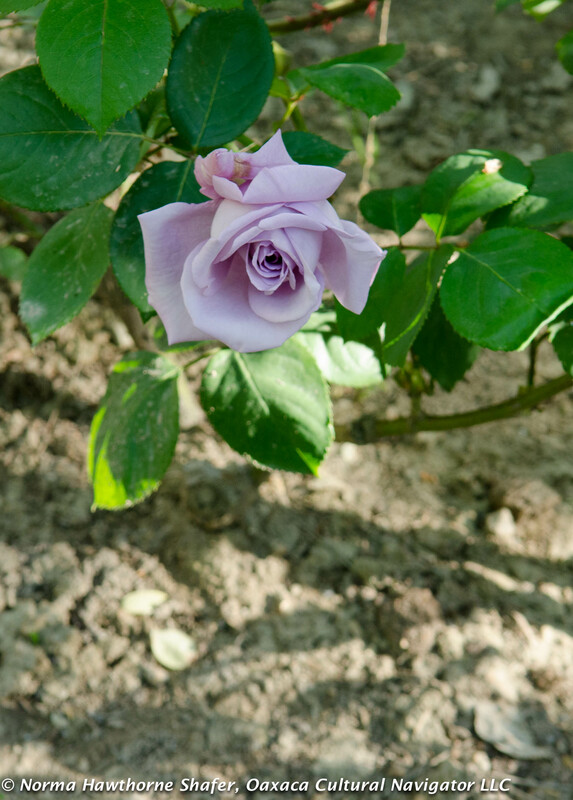 The cost is comparable to other venues, the views glorious, the gardens enchanting and the history is deep. It was the Franciscan monastery here where Isabella of Castile was first buried. Her remains were later removed to the Granada Cathedral by grandson Charles V, Holy Roman Emperor. 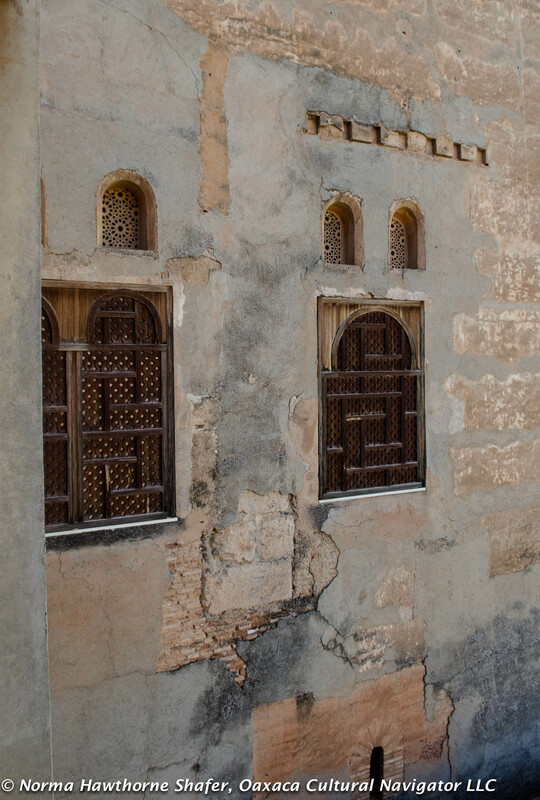 Take your time in the Nasrid Palace. Once you enter at your appointed time there is no limit to how long you can be there. We had the afternoon time slot that allowed us to enter the grounds at 2 p.m. with an 8 p.m. exit. Our ticket gave us access to the palace at 3 p.m. We lingered and let all the rushing tour groups pass us by. We were inside for over two hours just savoring the experience. Sit wherever you can and listen to the water. 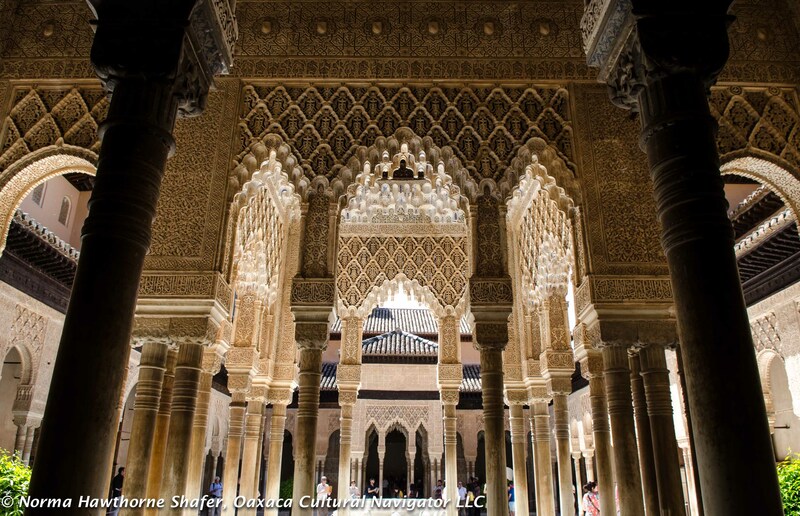 Fountains and running water were part of Moslem art and an integral function for living a prayerful life. It is meditative and tranquil. Look up. The ceilings are filled with surprises. 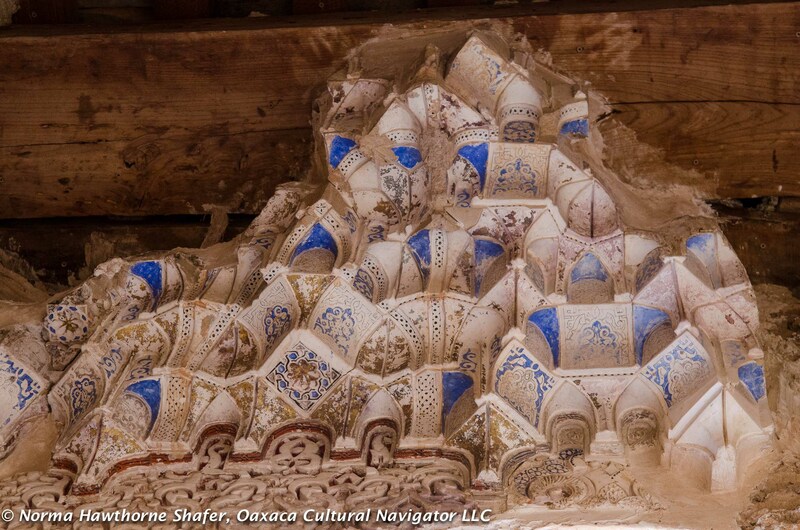 Honeycomb domes have been able to withstand centuries of earthquakes with little or no damage. 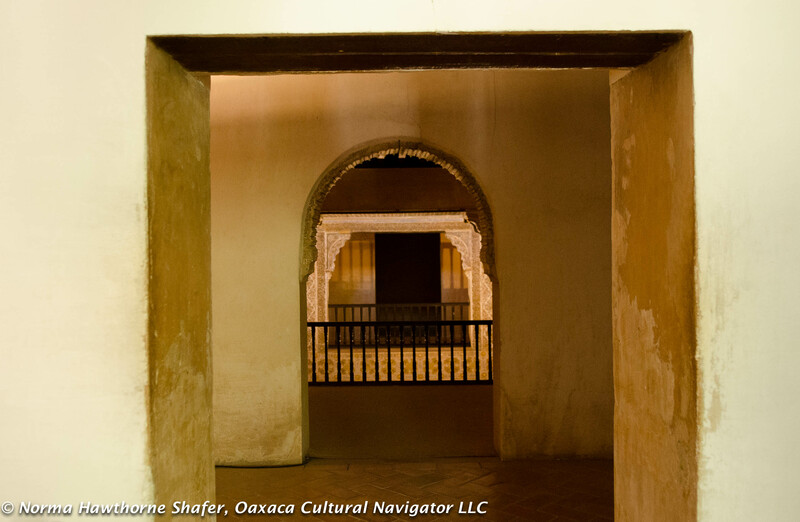 Step into archways and niches. 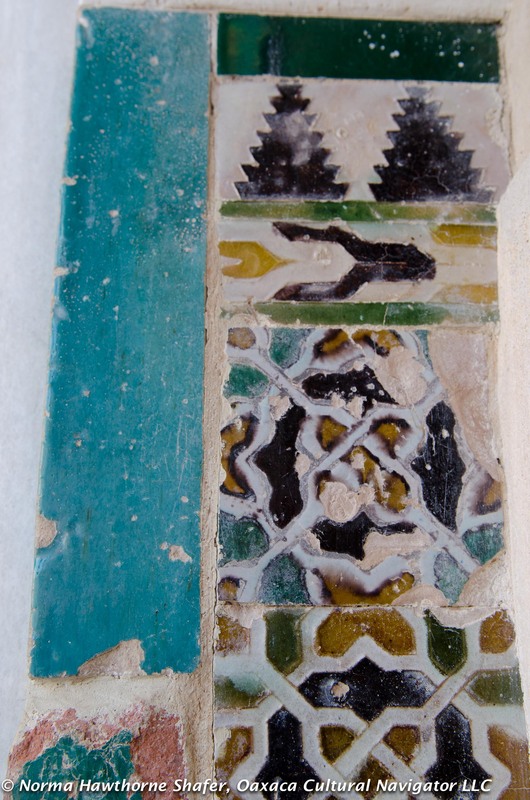 Even the backs of the openings are filled with messages and prayers, inscriptions in Arabic, remains of polychrome frescoes. It’s hot in Granada in April. Walking shoes, lightweight clothing, sun protection (cream and hat) are musts. The locals say in summer it can get close to a hundred degrees Fahrenheit. So, please plan your packing accordingly. Early mornings and night were chilly for us so we had shawls and jackets along, too. And, we were constantly thirsty. Water, water everywhere also means slurping down Gatorade to stay hydrated! 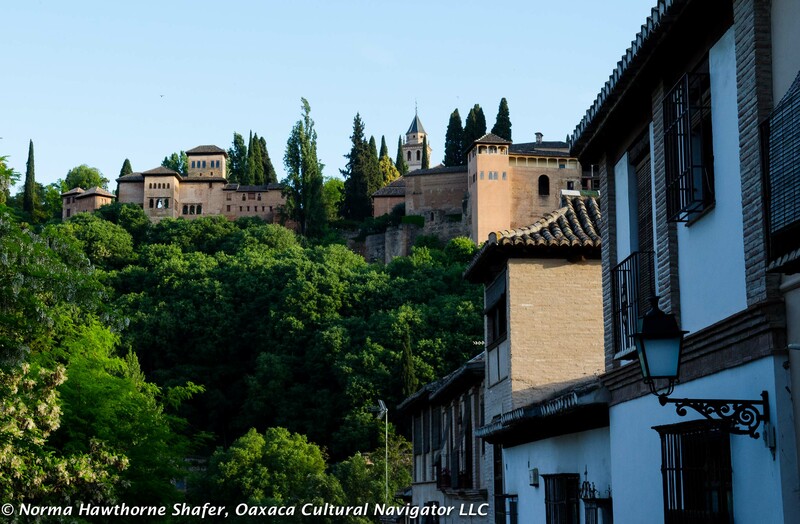 Of course, the locals prefer to drink beer the beverage of choice beginning as early as 10 a.m.
One afternoon we decided to walk down to the Darro River from the Alhambra to return to our hotel Casa Morisca. It’s a steep slope and in the descent you can understand how the Moors were able to rule the Iberian Peninsula from here for seven hundred years from this strategic mountain top. In 1492, at the beginning of the Inquisition, when Spain unified under the Catholic kings, Moors and Jews were required to convert to Catholicism or leave. Those who converted were always suspect of practicing their religion in hiding and were often brought before the Inquisition to test their faith. 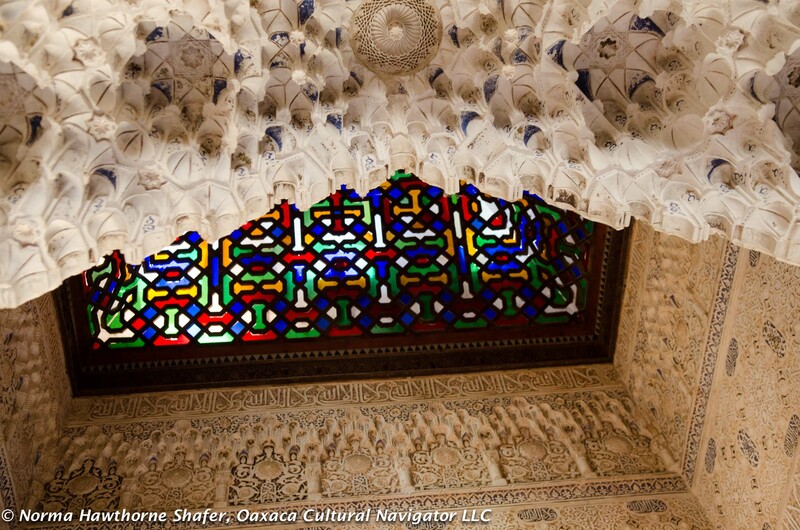 There were no surviving Jewish communities in Spain after 1492 and mosques are forbidden here. 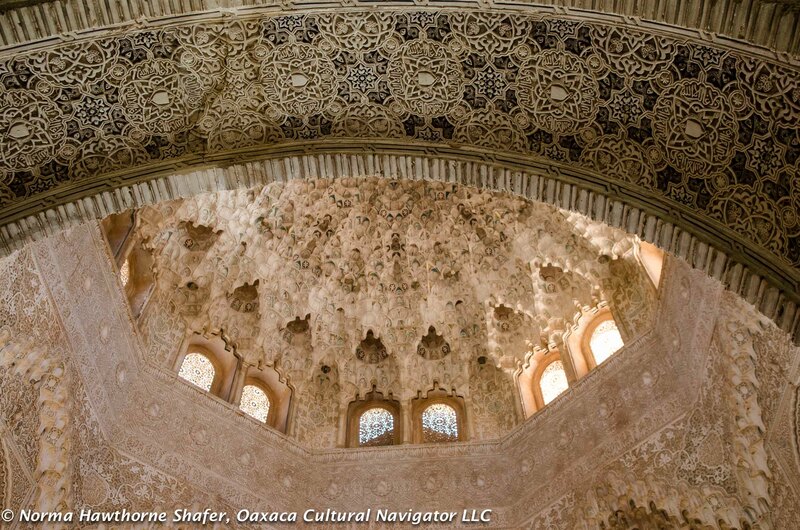 Many conversos moved to New Spain where they practiced Catholicism embedded with ancient Jewish rituals. We are in Girona now, north of Barcelona, where we are visiting the best surviving medieval Jewish neighborhood in Spain under the shadow of the most amazing Cathedral that was started in 1038 A.D. atop a Roman forum. 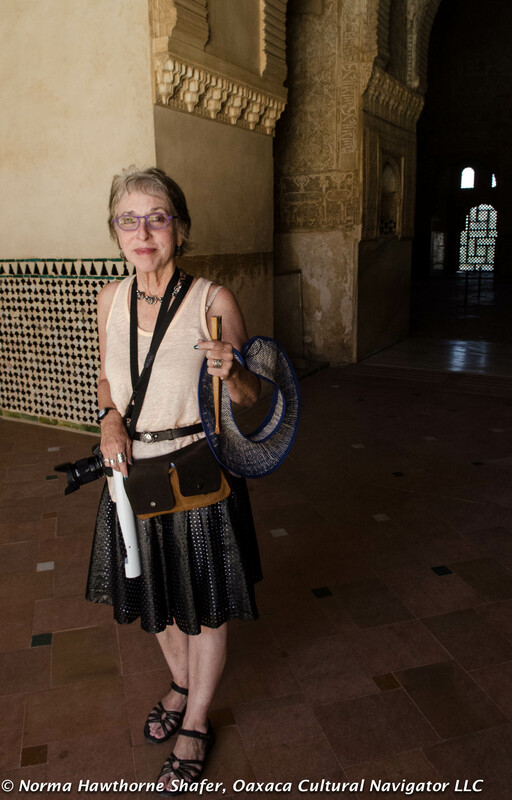 Rather than playing catch-up, I’m skipping over the Guggenheim museum and our visit with Brigitte Huet and Ivan in Bilbao for now and jumping into the present: Granada, Spain, where we arrived last night. 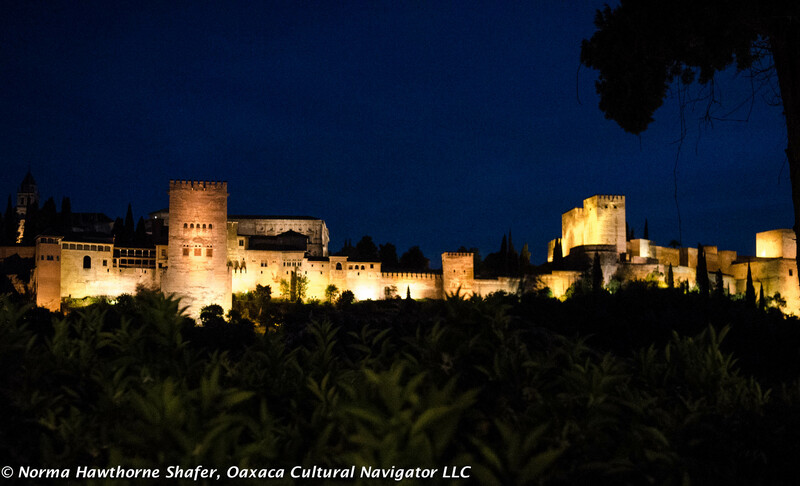 Just in time for some stunning views of the Alhambra. 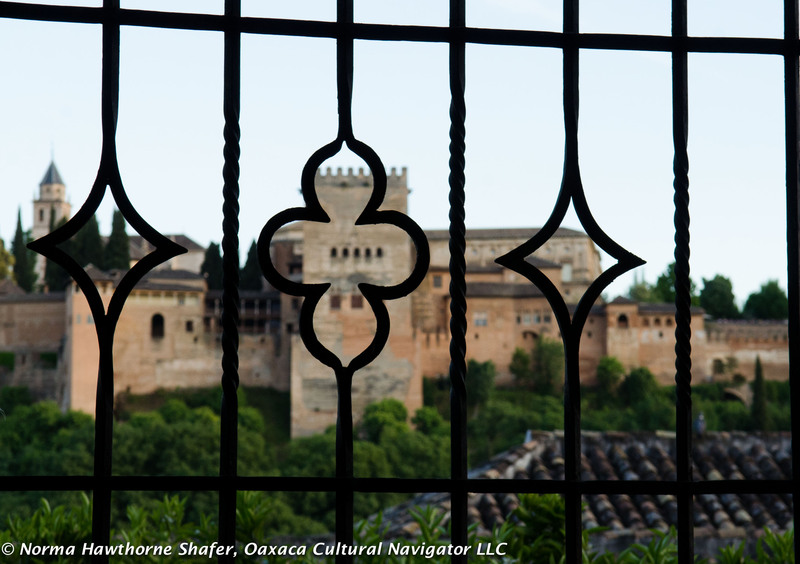 We are staying at the Casa Morisca which is in the old Arab quarter, the Albaicin, just beneath the Alhambra. This is what we saw as we emerged from the taxi from the airport. It’s warm here and will reach over 80 degrees F. today. That’s about 20 degrees hotter than in Bilbao. This is hill country with cobblestone pavements, steep stairways and small curving roads cut into the mountains. The snow capped Sierra Nevada mountains are within a half hour drive, as is the beach going in the other direction. For now, we are concentrating on getting better sleep, good food — a la food and views from Mirador Morayma and seeing how my knee holds up! This is what we came for! As night descended and our meal ended, this is our view! 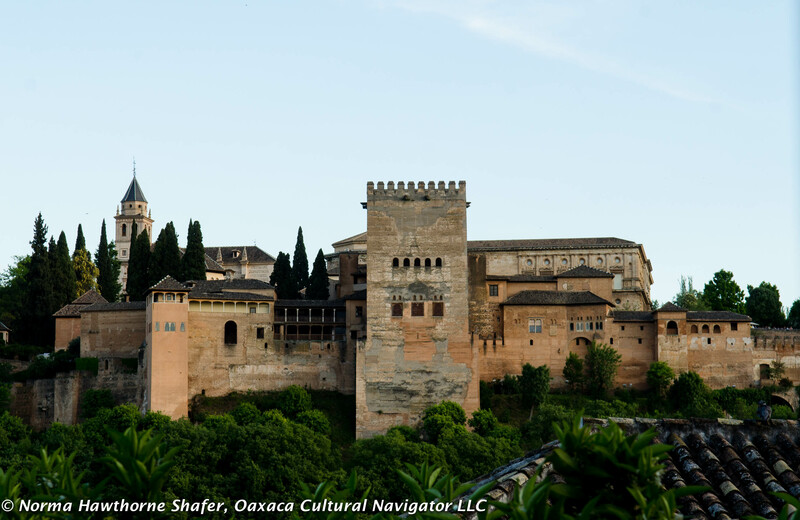 Of course, the Moors in Spain and their expulsion along with the Jews in 1492 begins in Granada. This is the symbol for the unification of Spain and the beginnings of the official Inquisition, which extended to all of Spain’s territories — including Mexico — and lasted until 1834.